Just an update on what’s occurred over the year of 2014. It’s been an incredibly busy year with astounding results from a large number of projects, many reached fruition in 2014 and many are nearing completion with much new information discovered in 2014. 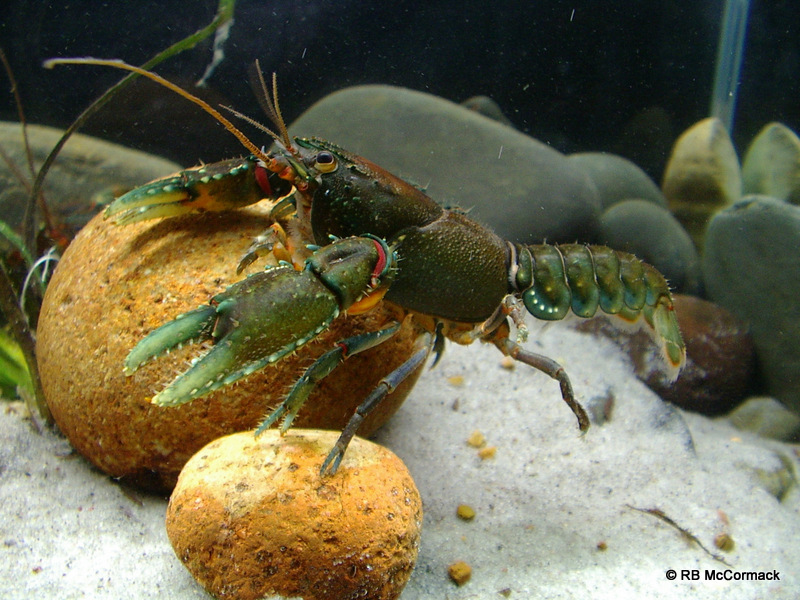 The Australian Crayfish Project continues to increase the knowledge base on our freshwater crayfish and works towards their conservation. There is a team of us working on this project made up of Paul Van der Werf, Chris Van der Wyk, Craig N Burnes and myself. 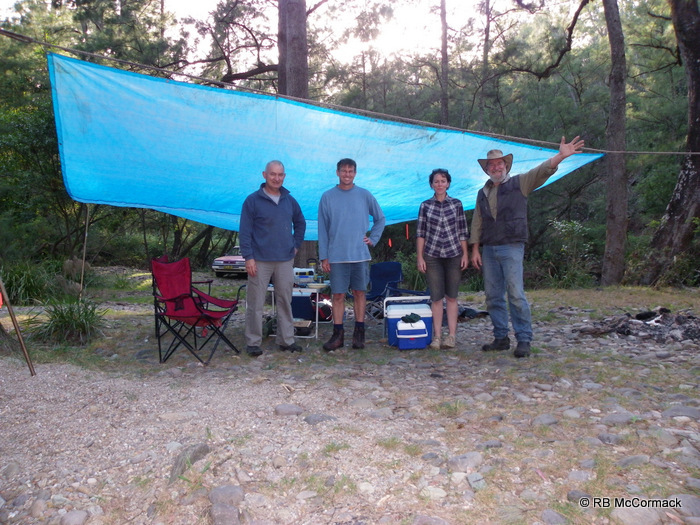 We have had fantastic support from the Queensland Parks and Wildlife Service who have provided accommodation, information, support and encouragement for our survey efforts. Unfortunately, the weather has been less than cooperative and on one wet and stormy day I got everyone lost so wasted half a day getting us back on track – “me bad”. Other than that it’s just been a matter of hard work, sweet and effort to survey hundreds of square kilometres of rainforest all on foot. It’s been a great project in a fantastic area with astounding results to date. 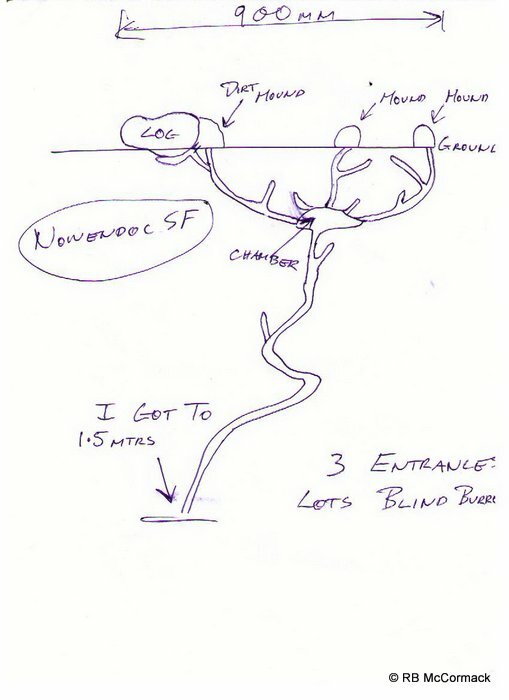 The final surveys are scheduled for early 2015 and will include a hike up Christmas Creek to the Stinson Plane wreck site. Unfortunately, the planed expedition this year, late 2014 was cancelled when one of our volunteers broke his toe the week before. 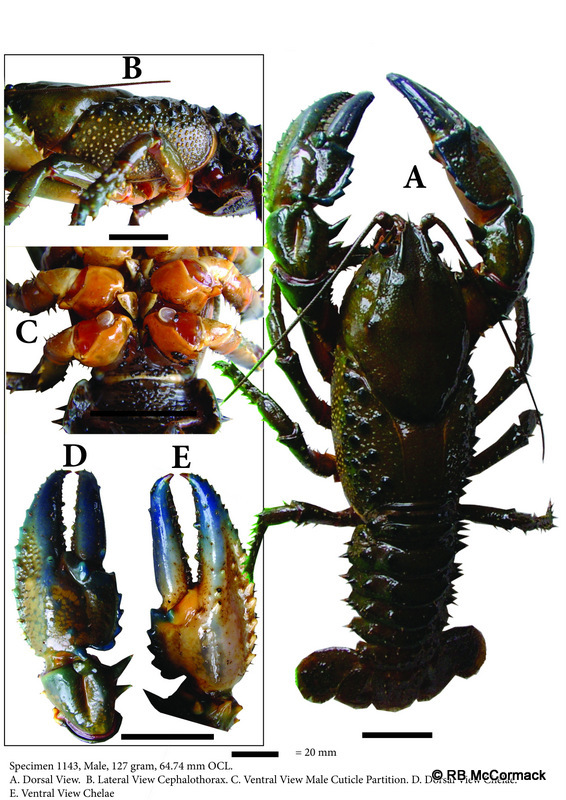 The paper titled: The distribution, ecology and conservation status of Embezee’s Crayfish Euastacus binzayedi Coughran et al., 2013 (Crustacea: Decapoda: Parastacidae), a dwarf freshwater crayfish from the Gondwana Rainforests, south-eastern Queensland. 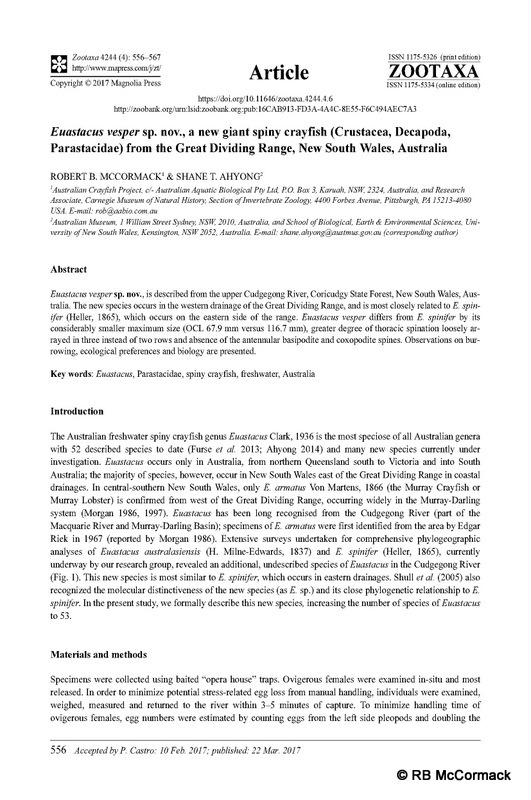 Abstract: Embezee’s crayfish Euastacus binzayedi is a small freshwater crayfish recently described (2013) from only one location in the upper reaches of the, Logan River, Queensland. 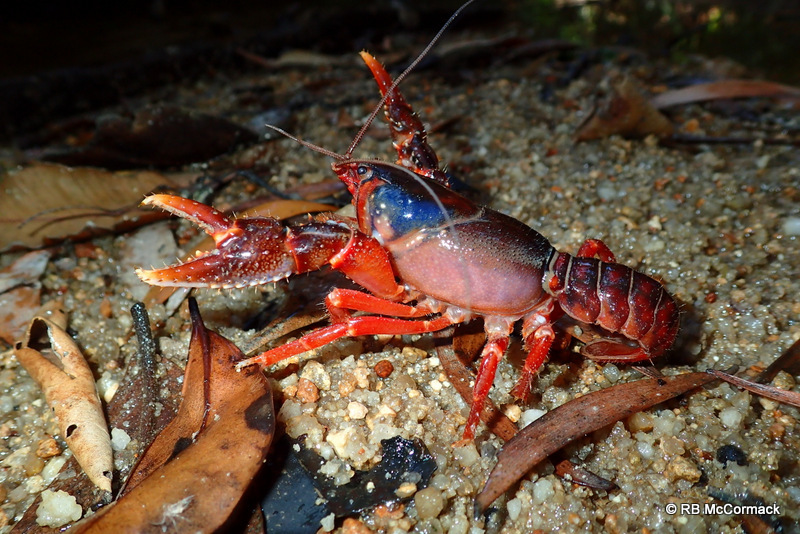 Recently biological surveys by volunteers as part of the broader Australian Crayfish Project (ACP) and with the support of Queensland Parks and Wildlife Service have gathered new information on the species ecology, distribution and conservation status. 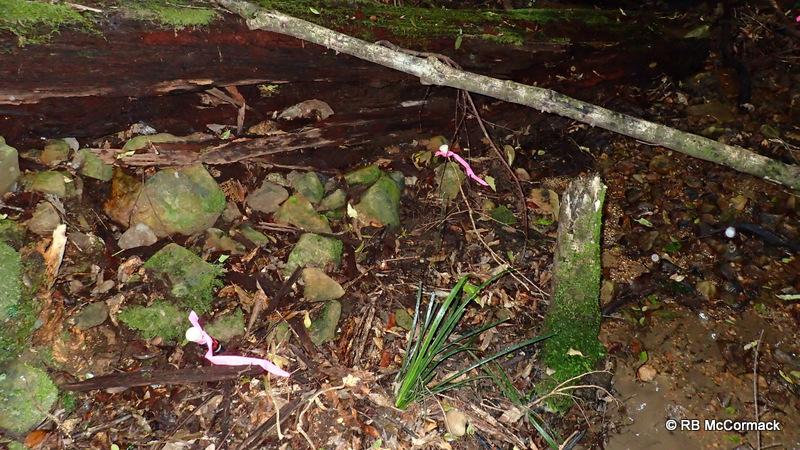 We have conducted a number of surveys over 2014 and hope to complete our surveys of the whole of Lamington National Park and surrounding area by early 2015 and present a paper on our research by mid 2015. Due for publication in 2015, stay tuned. 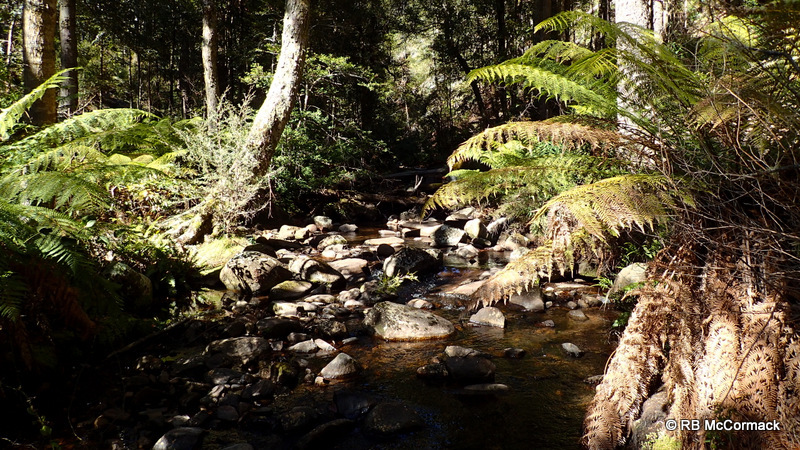 Upper Shoalhaven River surveys continue. 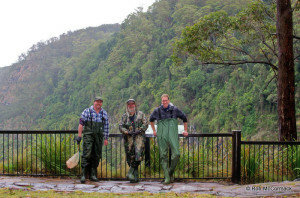 Biodiversity and water quality survey & report of the upper Shoalhaven catchment upstream of Warri Bridge is in progress ( see “Click Here” for futher information on this AABio project). As a result of this AABio project (for more information on this project “Click Here”) we have made some incredible discoveries. 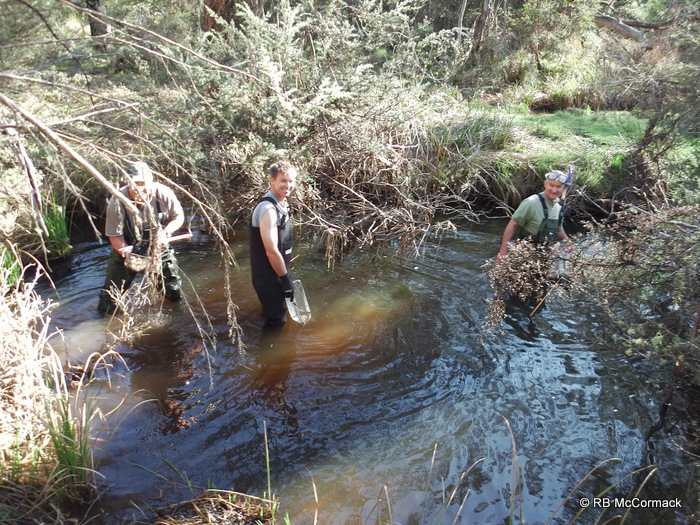 This project sponsored by the Upper Shoalhaven Landcare Council Bio Program and Australian Aquatic Biological P/L has discovered an incredible amount of new information on the Parastacidae species present in the Shoalhaven catchment. Originally, expected to map the distribution of translocated Cherax destructor, E. yanga and E. claytoni in the upper Shoalhaven. 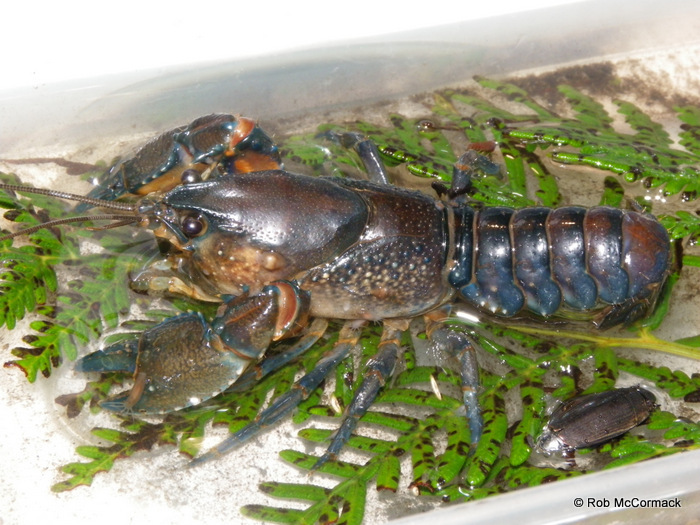 This went out the window when we discovered what seems to be Euastacus crassus in the upper Shoalhaven catchment and another new undescribed species. 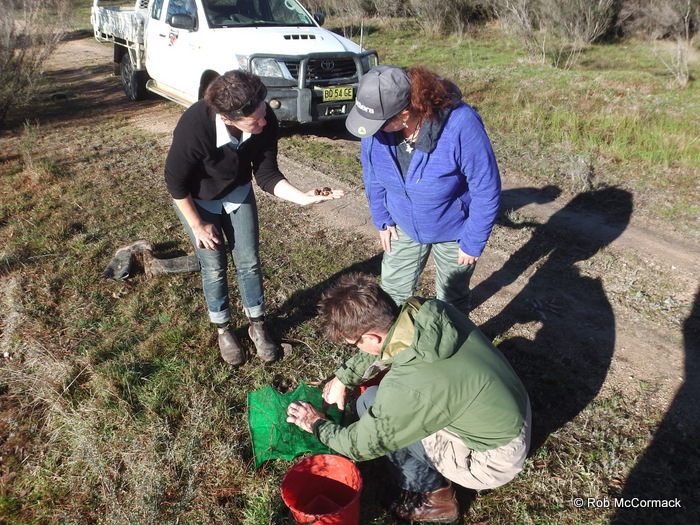 These two new discoveries have led to the generation of 2 new ACP projects to research these species and our research has overflowed out of the Shoalhaven into the adjoining Murrumbidgee, Tuross and Deua catchments. 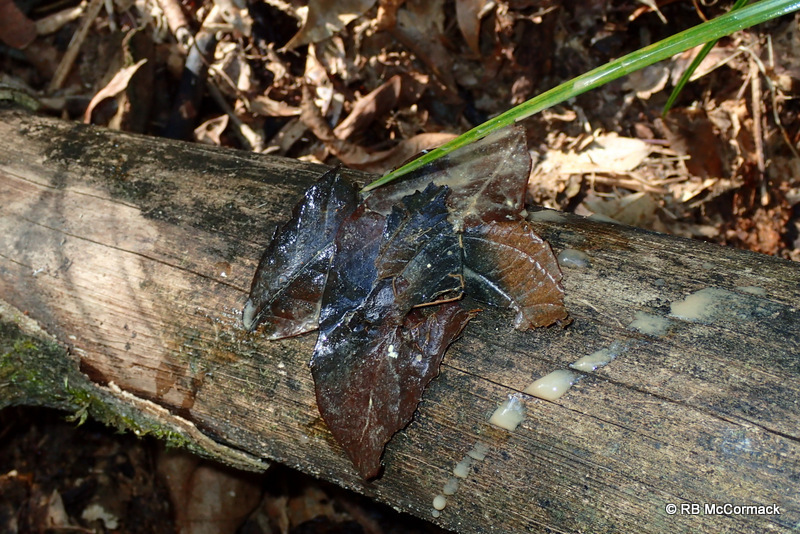 Research and documentation of these 2 new species in the Shoalhaven catchment will culminate in scientific papers. Stay tuned for further incredible results in 2015. Our conservation project on Euastacus clarkae is completed and the paper has been submitted to the Journal of Crustacean Biology (http://www.brill.com/journal-crustacean-biology ). It has been accepted and reviewed and we expect publication in early 2015. The Journal of Crustacean Biology is the official journal of The Crustacean Society for the publication of research on any aspect of the biology of Crustacea & other marine arthropods. As a member of the Crustacean Society http://www.thecrustaceansociety.org/ I wholeheartedly recommend that you join us and share in the mission of the Crustacean Society. Our mission is to advance the study of all aspects of the biology of the Crustacea by promoting the exchange and dissemination of information throughout the world. This ACP E. clarkae project was supported with a Mohamed bin Zayed Species Conservation Fund (MBZSCF) grant (Project 12054688) and I am extremely grateful for their generous support. The MBZSCF is a significant philanthropic endowment established to provide targeted grants to individual species conservation initiatives, recognize leaders in the field of species conservation and elevate the importance of species in the broader conservation debate http://www.speciesconservation.org/ . 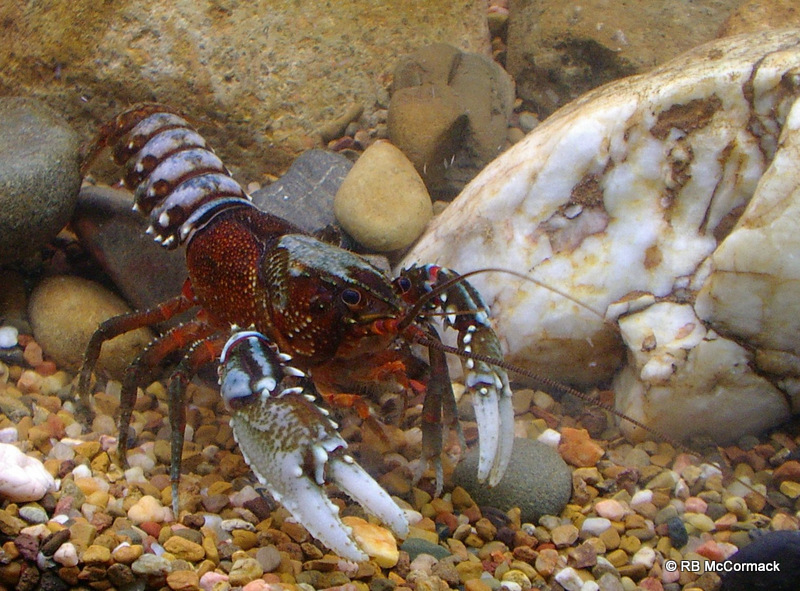 CONSERVATION OF IMPERILED CRAYFISH – EUASTACUS CLARKAE MORGAN 1997 (DECAPODA: PARASTACIDAE), A HIGHLAND CRAYFISH FROM THE GONDWANA RAINFORESTS OF AUSTRALIA’S WORLD HERITAGE AREA. 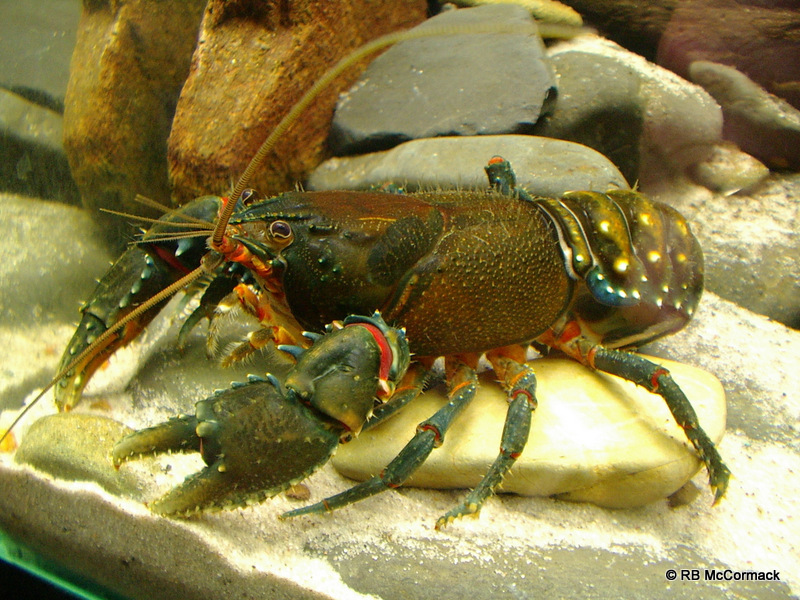 The imperiled Clark’s Crayfish Euastacus clarkae Morgan (1997) was described from a handful of juvenile specimens collected from one location in 1981. 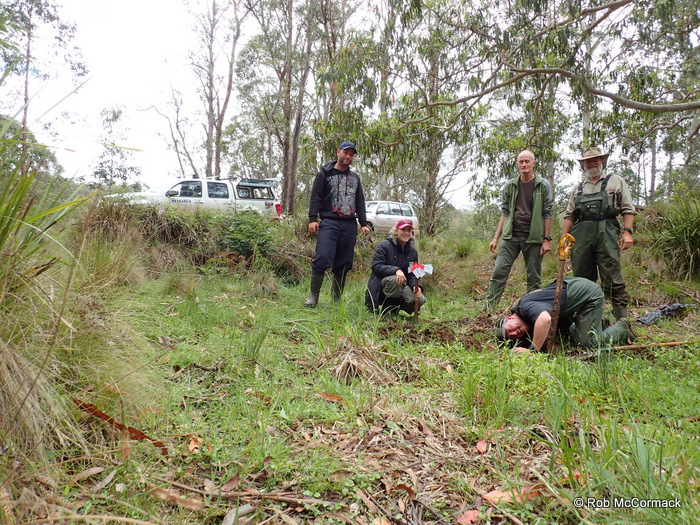 The Australian Crayfish Project recently completed an intensive field survey project to better define its distribution, habitat, biology and conservation status. 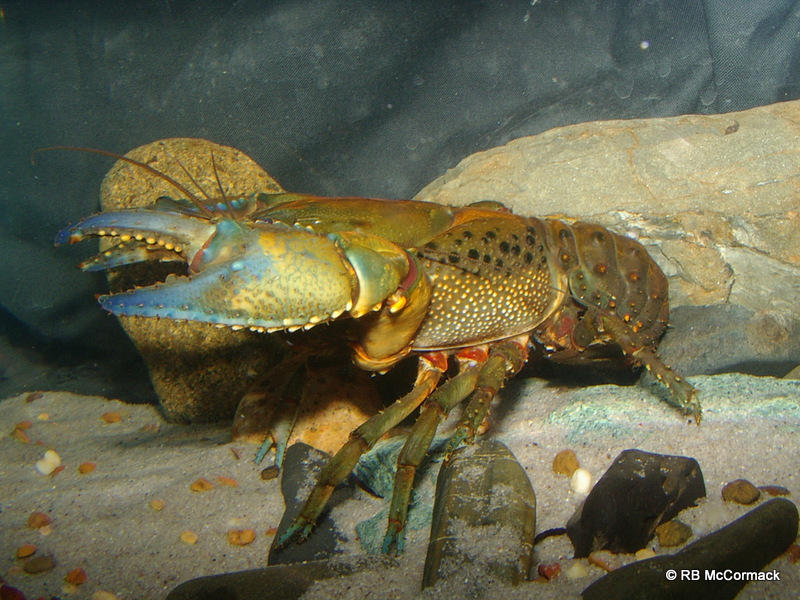 Euastacus clarkae is restricted to headwater reaches of highland streams feeding the Hastings and Forbes rivers, at elevations ranging from 670-1150 m. The entire Hastings River catchment (3,846 km2) was surveyed and established the Extent of Occurrence for E. clarkae at 200 km2. The distribution was almost entirely located within Werrikimbe National Park where the species was locally abundant. We recommended conservation down listing from Critically Endangered to Endangered and present information to support future conservation efforts and allow specific management plans to be drafted for this rare, highland species. To assist with identification we provide a key to this and other Euastacus found in the Hastings and adjoining drainages. Soon to be published in the Journal of Crustacean Biology (http://www.brill.com/journal-crustacean-biology ). This project had led to a number of off shoot scientific projects. We are preparing a paper on all the species of the Hastings Drainage, many never previously recorded. Additionally we are preparing a paper on E. maccai (see next item). 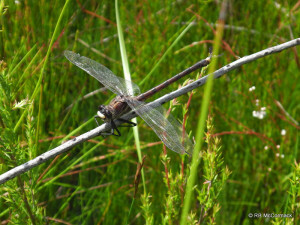 Additionally, recorded in the E. clarkae paper is information on E. simplex. Interestingly, Morgan 1997 documents Euastacus simplex as occurring in the Hastings drainage. Our research indicated this is incorrect and the paper validates our conclusions. The removal of the Hastings drainage from the distribution of E. simplex greatly reduces its distribution area but greatly increases the knowledge base of the species. 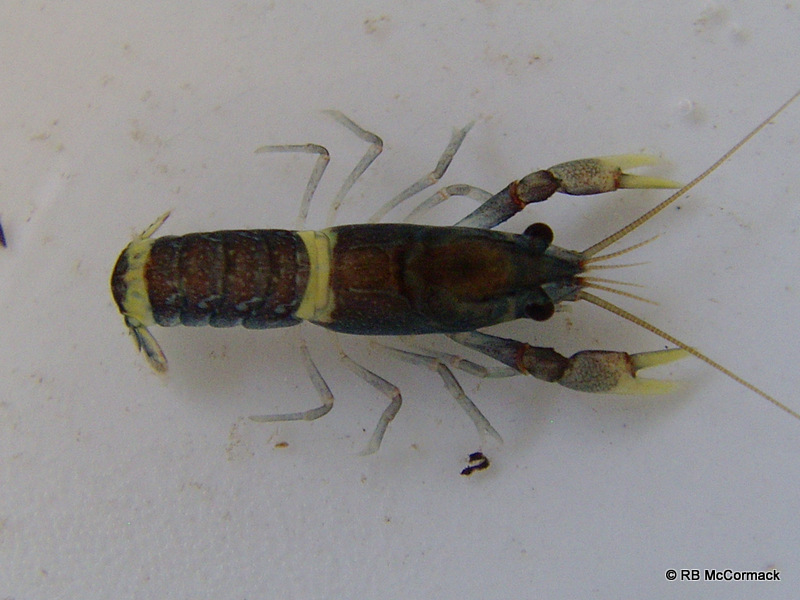 As an offshoot of the E. clarkae project we discovered Euastacus maccai in the Hastings drainage for the first time. Originally suspected as occurring within the Hastings in 2009, despite increasing efforts it was not till 2014 that a specimen was vouchered and its existence confirmed. Only 12 specimens of this species have ever been recorded prior to 2014 so a very rare and cryptic species. 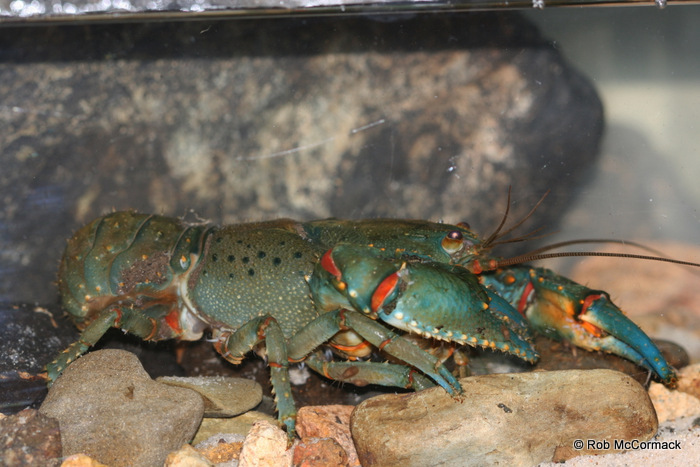 Status of the Terrestrial crayfish Euastacus maccai with range extension into Hastings River drainage, New South Wales, Australia. The terrestrial crayfish Euastacus maccai (McCormack & Coughran 2008) is documented for the first time from the upper Hastings River catchment. This new distribution represents a significant range extension for this rare and elusive freshwater crayfish species. To assist conservation and management of the species we present biological and ecological information together with a key to this and other species of Parastacidae found within the Hastings and adjoining catchments. We will continue with research on this species into 2015. 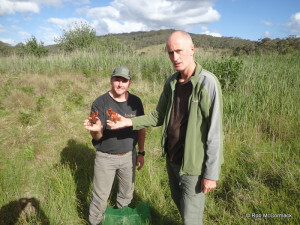 In late 2014 volunteers on the Australian Crayfish Project documented 3 new locations for the species an managed to capture two new specimens from the Hastings drainage. We have been trialling mist net snares as a capture method for this species. These type snares have proved very effective on other Euastacus species like E. reductus. However our trial in December 2014 for E. maccai proved interesting but unsuccessful. 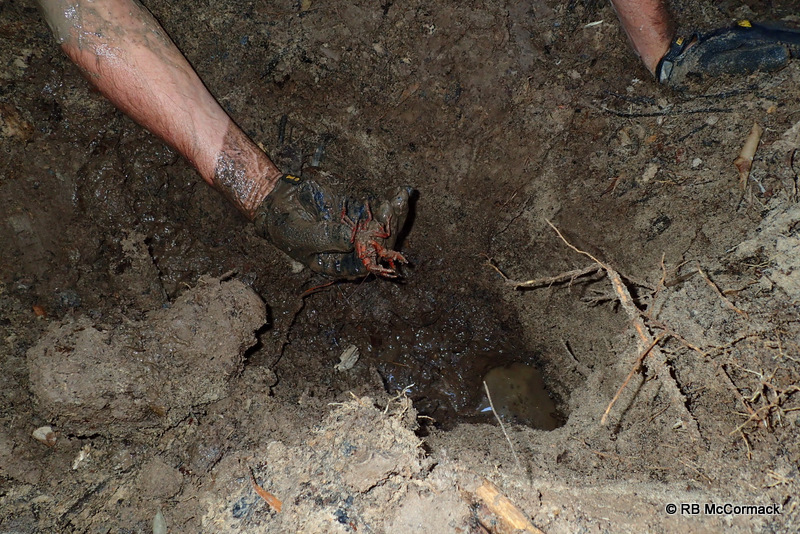 We deployed 8 snares, 6 in untouched burrows and 2 in excavated burrows. Of the 6 set in untouched burrows 4 had been filled with excavated material renderinging them useless, 2 had captured animals but they had torn free. Of the other 2 one was set in a burrow that had been excavated (approx. 700 mm deep) but no animal captured. It had captured the animal but again the mist net was not strong enough and it had torn away. 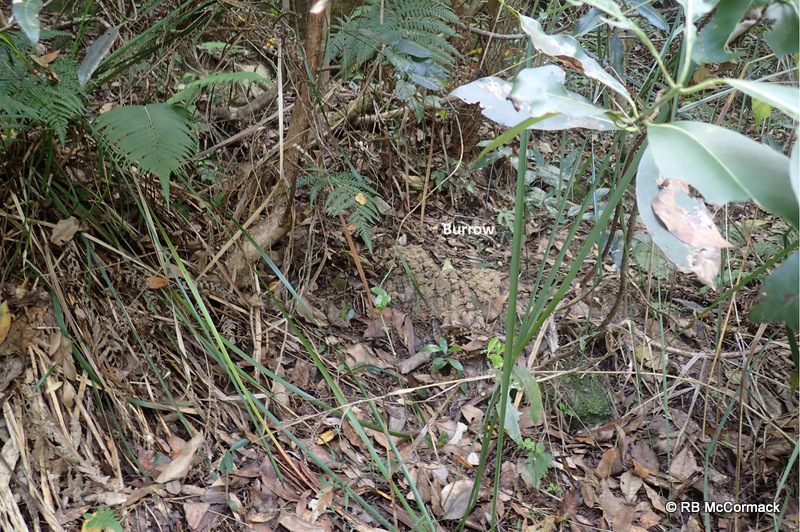 The other snare was set in a burrow that had been partly excavated (850 mm) and a specimen collected. 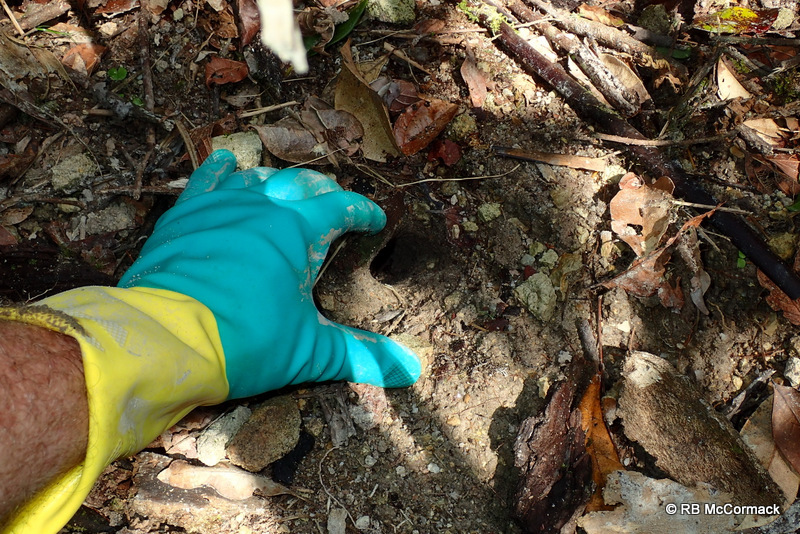 Although the burrow extended a further metre or so this snare remained untouched. This was a male we capture from that burrow so seemingly it was the only one using the burrow. This project will continue into 2015. We have never seen a berried female of this species and although we expect the juveniles to live in the same burrow as the mother we don’t have one scrap of evidence to support this hypothesis. The project will continue with digging teams to excavate burrows and we will be doing extensive surveillance surveys in 2015 where we film the burrow entrances and forest floor at night to ascertain just what this species gets up to. Stay tuned for some intriguing results. A paper describing a new species of Gramastacus was published in Zookeys ( http://www.pensoft.net/journals/zookeys/ ) in April 2014. 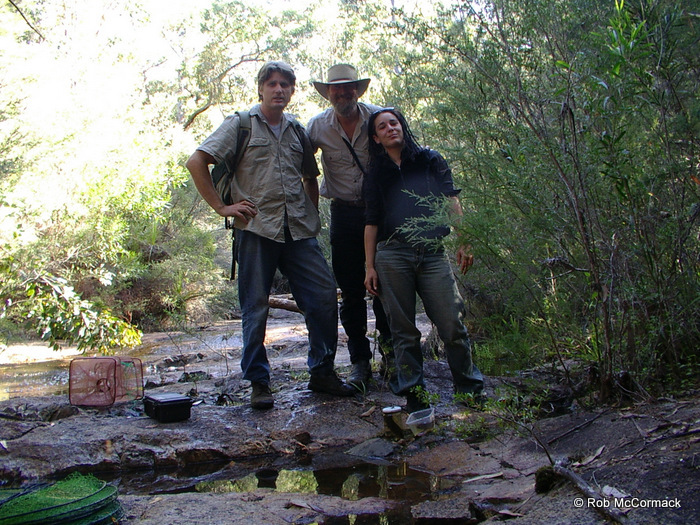 This paper is the culmination of 8 years of research in the coastal creeks and swamps of NSW. Though the description has been published, we continue to research this species with a number of projects ongoing. Gramastacus lacus sp. n., is described from coastal lowlands of the Central and Mid North Coast regions of New South Wales, Australia. 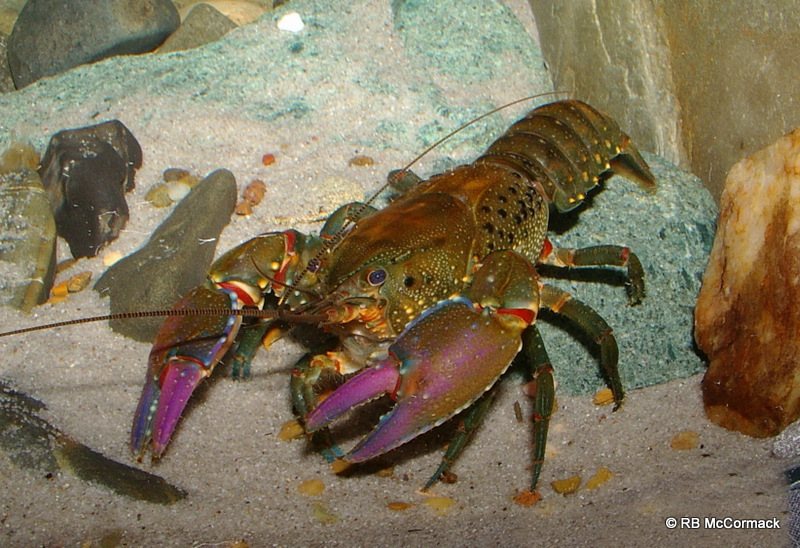 Gramastacus lacus has a restricted distribution in ephemeral habitats, being dependent on regular natural flooding and drying cycles, and burrows for survival during temporary dry cycles. 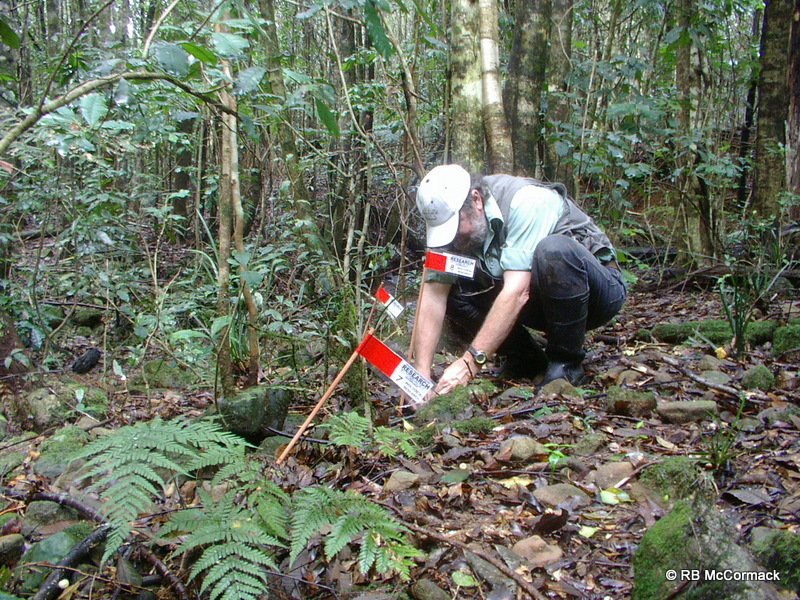 Documented are population distributions in lowland habitats (3–48 m, a.s.l.) from Wamberal Lagoon, north along the coastal strip to Wallis Lake. The species is small, reaching a maximum weight of 7 grams and 21.3 mm OCL, and distinguished by a large male genital papilla, large raised post orbital ridges, laterally compressed carapace and elongated chelae. Euastacus diversus was first described by Riek (1969) on the basis of 12 immature specimens collected from 30 miles north of Orbost in eastern Victoria, Australia, in 1956. Since then confusion has reined surpreme as Morgan in 1986 failed to find any specimens for his revision of Victorian Euastacus and together with taxonomic uncertainties and lack of new specimens all limited conservation and management efforts. Aquatic surveys by volunteers of the ACP between 2007 and 2011 collected specimens of Euastcus diversus from across its distribution and together with genetic analysis by Jim Fetzner from the Carnegie Museum of Natural History we were able to present a thorough redescription of the endangered freshwater crayfish Euastacus diversus Riek, based on morphologic and genetic analyses of this newly collected material from eastern Victoria, Australia. RE-DESCRIPTION OF THE ORBOST SPINY CRAYFISH, EUASTACUS DIVERSUS (RIEK 1969), IN EASTERN VICTORIA, AUSTRALIA. The COMPLETED paper has been presented by the lead author Jason, at the Biennial Symposium of the International Association of Astacology and the Carcinological Society of Japan. A joint International Conference on Crustacea, which was held at Sapporo, Japan on 20-21 September, 2014. 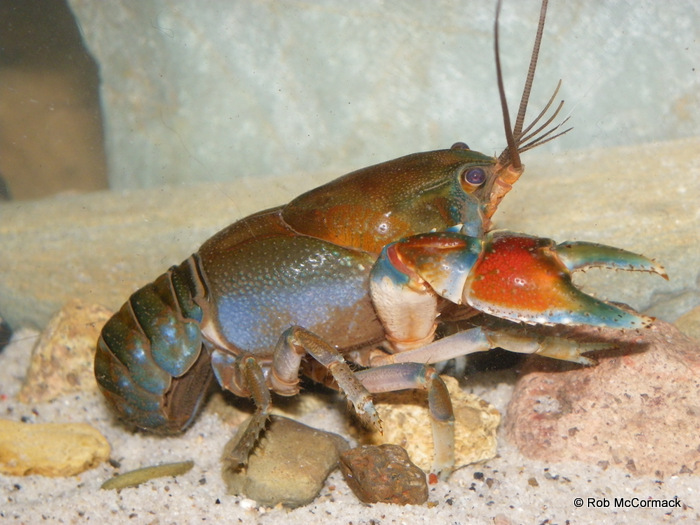 The paper has been submitted to “Freshwater Crayfish” for publication and we expect this to happen in 2015. New Euastacus species for Victoria. The E. diversus paper is based on specimens captured between 2007 and 2011. 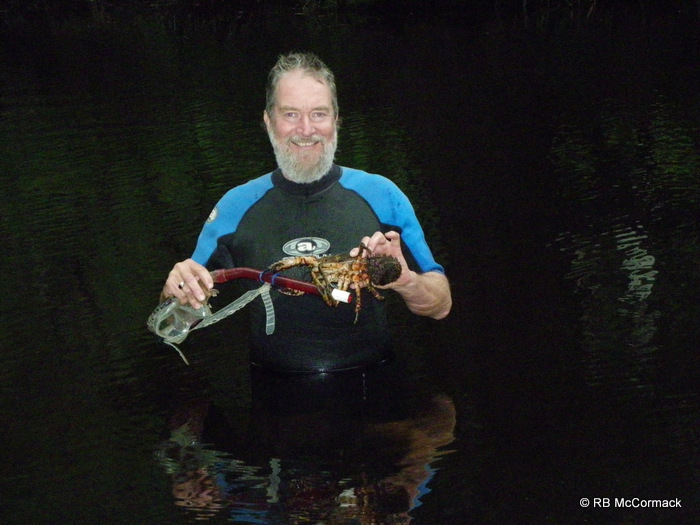 From 2011 to 2013 we were collecting specimens of 3 new Euastacus species. Our plan was to publish the description of the first of these new species with the E. diversus paper. The description is written but we needed to check the morphology and genetics across the limits of its distribution so needed more specimens, but unfortunately, this was not possible due to bureaucratic entanglements. Victoria was closed for research in 2014 thanks to the Vic WSIAEC. See article “Victoria Closed for Research”. If we ever receive approval from the WSIAEC to recreational fish for yabbies and fish the same as 5 million Australians do each year without WSIAEC approval then we will restart the Victorian projects. 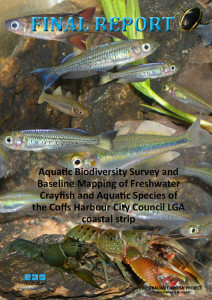 The Gosford City Council Ecological Research Grant Project; “Biology, distribution and abundance of Gramastacus crayfish and invertebrates in the Avoca and Cockrone Lagoon freshwater ephemeral habitats” is ongoing. We have not located any Gramastacus crayfish as yet, but interestingly we are finding large numbers of False spider crabs Amarinus lacustris. False spider crabs Amarinus lacustris are a widespread and relatively abundant small crab species inhabiting low salinity and freshwaters waters in south eastern and eastern Australia, New Zealand, and Lord Howe and Norfolk Islands. They are a small freshwater crab species only reaching 10 mm in body width, with a distinctive H-shaped groove on their back. They are a slow growing species that can be covered with weeds or algae growing on their shell which makes them harder to see and for predators to find. It’s a small vulnerable species that is cryptic in nature and rarely seen or captured, spending most of their life hiding in thick reeds and roots or under rocks that offer protection and shelter from predators. Research and surveys for this project will continue in 2015. Unfortunately, we were unable to conduct any research in Victoria during 2014 due to bureaucratic entanglements. 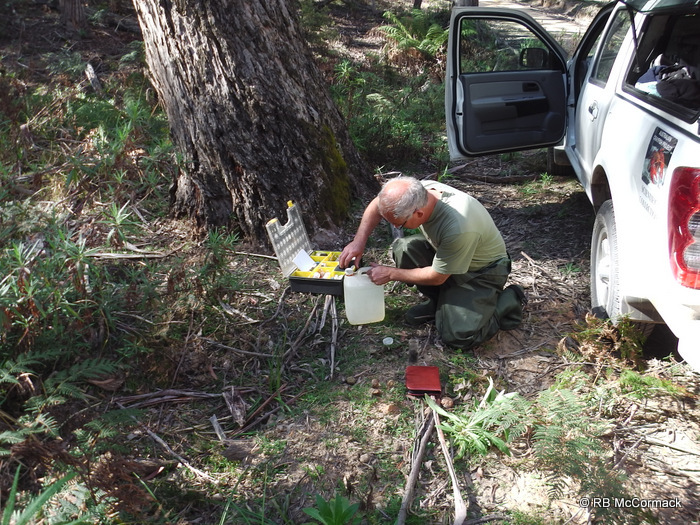 For the last 7 years I have had permits for scientific research in Victoria and have been dealing with Vic DPI and DSE which are both very professional and efficient departments. These two departments have now combined into Victorian Department of Environment and Primary Industries (DEPI) at that time (or now DELWP). My permits expired in April 2014 so in February I contacted DEPI and started the renewal process. All went smoothly and with exceptional professionalism and efficiency my new draft permit was ready, however, there was a hiccup. Under the new regulations to catch crayfish and fish in Victoria I now need Animal Ethics Committee approval. No problems I thought, I’ve been doing the job for 7 years in Victoria without a problem, have approvals from all the other states and I’m just recreational fishing for fish and yabbies, something 5 million Australians do every year without AEC approval, so how hard can it be? I proceeded to contact the Wildlife and Small Animal Institutions Animal Ethics Committee (WSIAEC). Chatting to them initially they told me of the difficulties others had getting approval and how the most innocent of research projects had been rejected in the past. That should have been my first hint as to how things would go. Instead I laughed with them at the misfortune of others and proceeded to progress my application. The final application (some 35 pages) was sent early March 2014. That was promptly reject for a whole bunch of reasons which I felt were all unreasonable. (Don’t get me started on the rejection). However, I said nothing and promptly sent a reply with some additional 14 pages of information. This is where the whole application took a left turn straight back to the 1920’s. I had great difficulty getting my mind around their response. It seems that they don’t accept responses to additional information they have requested, the applicant needs to reapply in full from scratch incorporating any additional requested information into the new applications. Now I have applied for hundreds of licences, permits and consents over the last 30 years to local, state and federal governments departments and never come across this gross inefficiency. So now I have to reapply and send in a new application of 50 pages which the WSIAEC has to go through again from scratch, wasting their time to do the exact same thing they did last time but now try and see that I have added the information they requested. The gross inefficiency and complete waste of resources is unbelievable. It is not only a tremendous waste of my time but why are Victorian taxpayers funding such a grossly inefficient department? So I send in the 2nd new complete 50 page application and guess what! You guessed it, they have more questions and demands. So again I must reapply in full from scratch. So I send in the 3rd new 50 page application. It’s the end of December now and still no WSIAEC approval. They charge me $550 for this lack of service and the waste of my time for most of the year. I’m a very dissatisfied customer. Do you know the kicker? On the bottom of their emails they state “Please consider the environment before printing this email”. How hypocritical, whole forests have been consumed by their inefficiency and demand for paperwork. At a time when all government departments are struggling for funding and all are cutting services and increasing efficiency, to have a department that is so grossly inefficient and wasteful is a travesty, why the Victorian people fund this WSIAEC is inexplicable. Let me be extremely clear. I have no concerns with Victorian Department of Environment, Land, Water and Planning which is a very professional and efficient department. They are as good as or better than any of their interstate counterparts and I’ve used them as examples of efficiency and ability to other interstate departments in the past. Yet for me to receive their permit I need approval from the “Department of Economic Development, Jobs, Transport & Resources, Wildlife and Small Institutions Animal Ethics Committee” that is the exact opposite and that is what makes this whole horrid episode so unbelievable. Lets hope that in 2015 WSIAEC approval is finally received and the ACP research can continue. 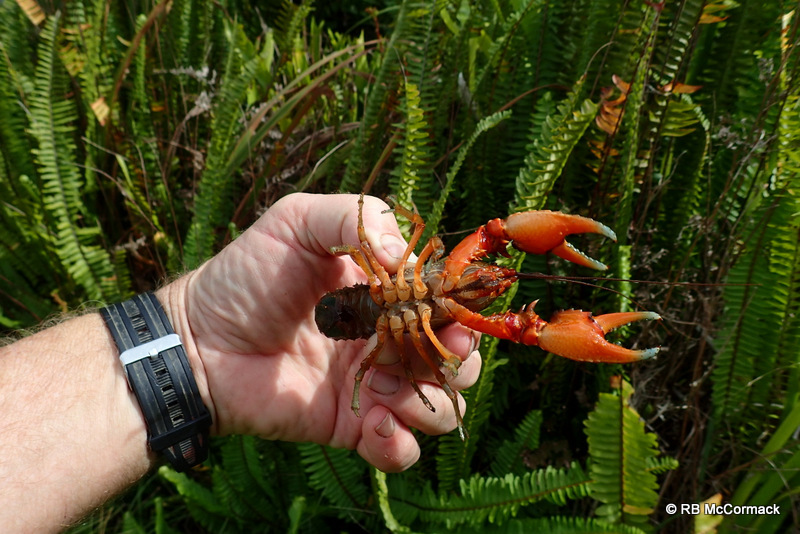 Aquatic Biodiversity Survey and Baseline Mapping of Freshwater Crayfish and Aquatic Species of the Coffs Harbour LGA. Was completed in 2014 and the 103 page final report issued to council in July 2014. It was an extremely interesting survey in a tremendously scenic area. The project concentrates on the 64 km section of coastal strip between the sea and approximately 20 km inland generating a total of 1280 square kilometres under investigation. 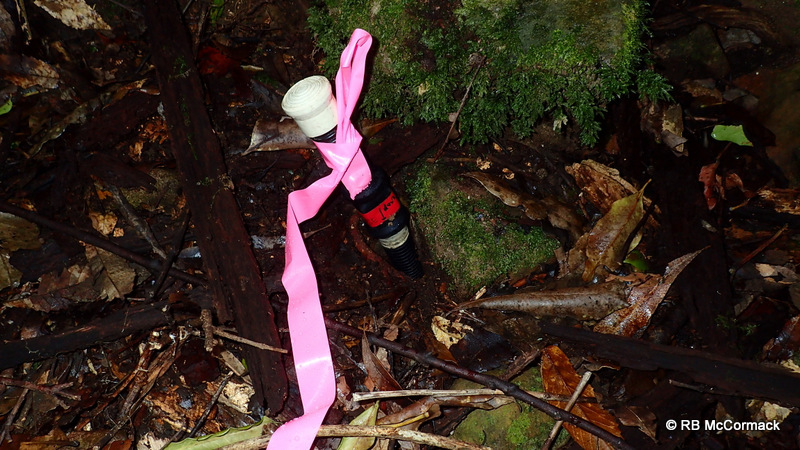 Ephemeral creeks and swamps not normally surveyed were specifically targeted and resulted in some very interesting findings. 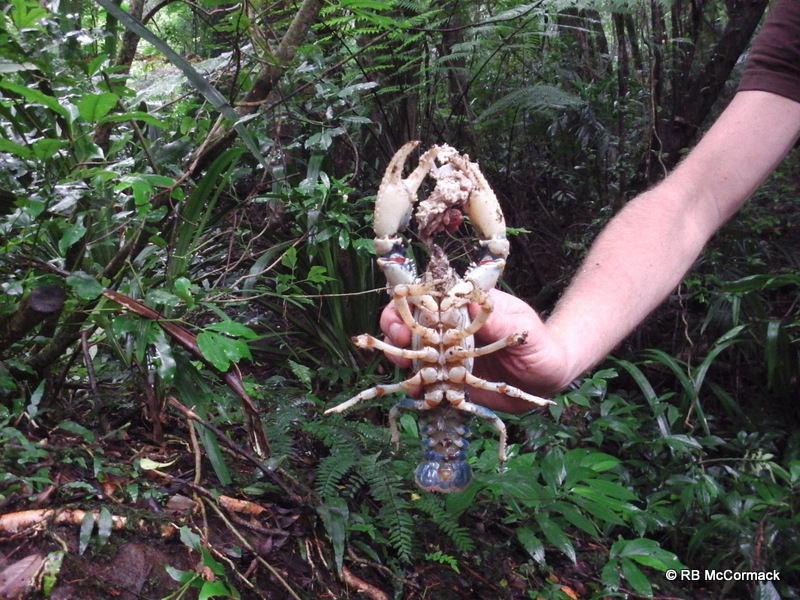 We were specifically looking for Tenuibranchiurus crayfish as part of our ongoing project. 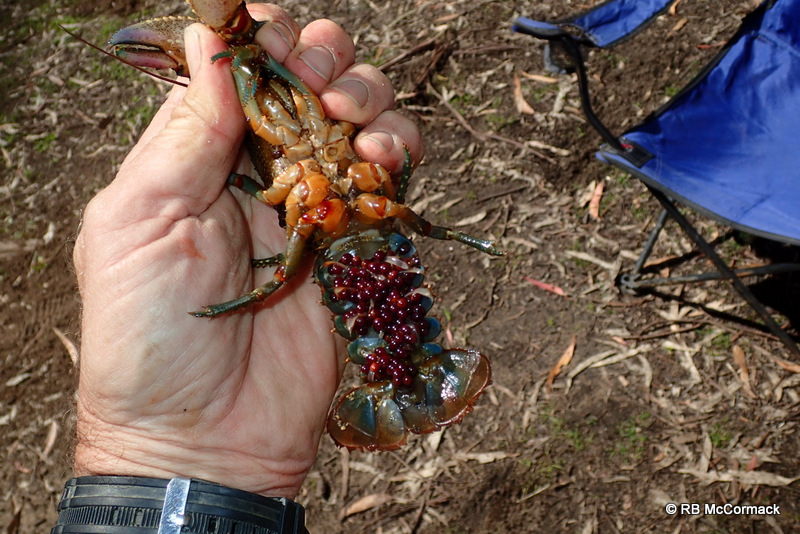 We were also targeting Cherax cuspidatus as part of that project and just generally mapping not only freshwater crayfish but all fish, molluscs, macro inverts and gastropods, etc. Interestingly we document The River Swimming Crab Varuna litterata in the area for the first time. See next article. Project 100062-1. 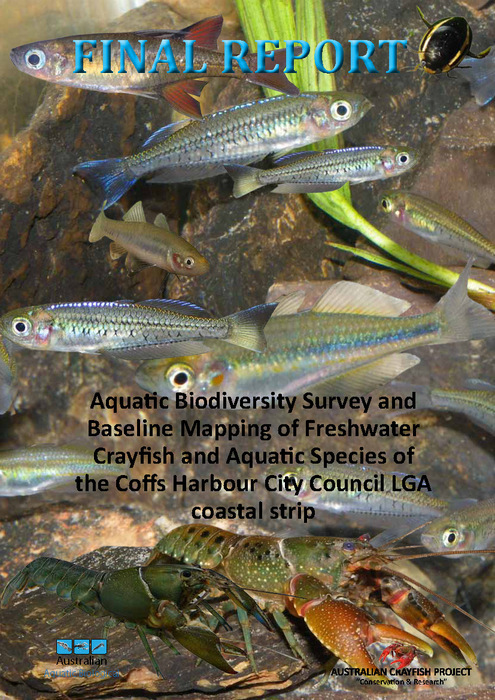 Aquatic Biodiversity Survey and Baseline Mapping of Freshwater Crayfish and Aquatic Species of the Coffs Harbour LGA. Was completed in 2014 and the 103 page final report issued to council in July 2014. 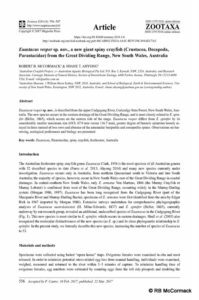 New Distribution Records of The River Swimming Crab Varuna litterata from coastal New South Wales, Australia. 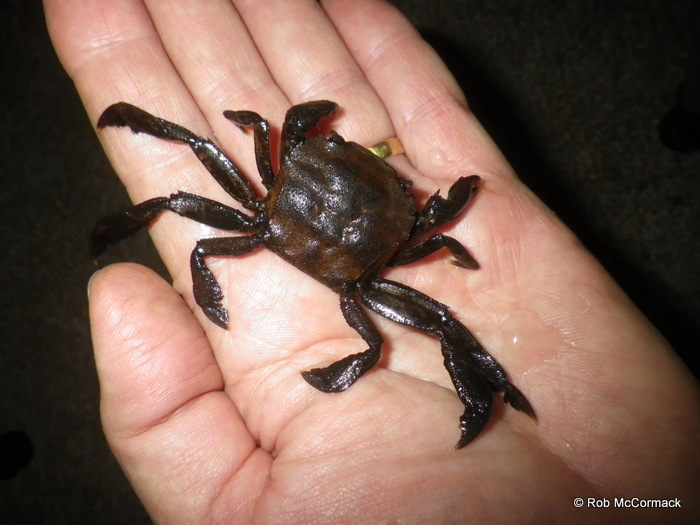 The river swimming crab Varuna litterata (Fabricius, 1798) is recorded for the first time from the Coffs Harbour area of New South Wales (NSW) Australia. Specimens were collected from sites 40 km apart in Yuraygir National Park and Boambee, NSW. A tropical species previously only recorded as far south as south east Queensland, their presence so far south represents a major range extension and the likely hood of climate change and a strengthening East Australian Current contributing to this range extension is discussed. An undescribed species of Tenuibranchiurus occurs in coastal NSW. For a number of years we have been researching this species. The Coffs Harbour research project contributed to the information base on this species but much more is required. This project will be ongoing in 2015 and well into 2020. The Coffs Harbour and Port Macquarie research projects both contributed tremendously to this project. 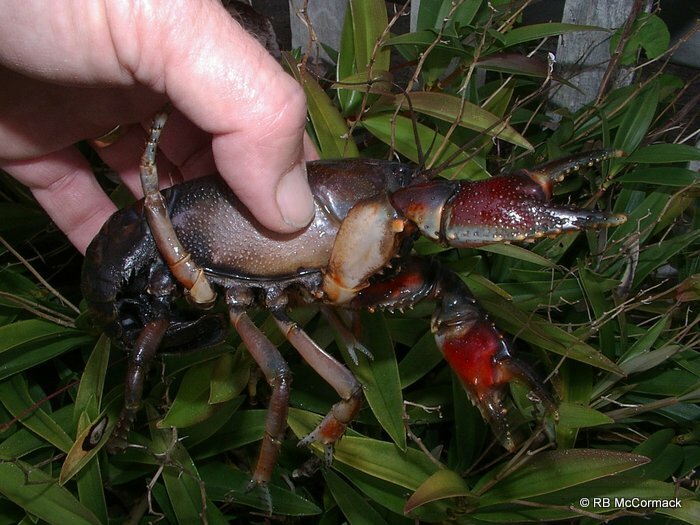 A major project is the redescription and description of all Cherax species in eastern Australia. 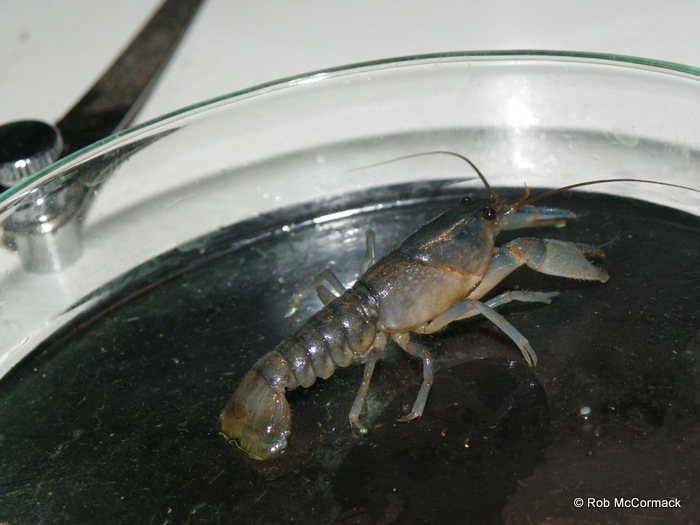 Cherax cuspidatus is the first of 3 Cherax species we will completed and published in 2015/16. Stay tuned for this redescription in 2015. Project 100062‐2 is completed. 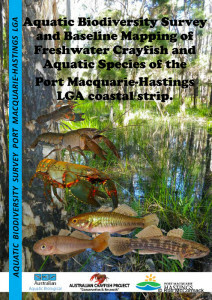 Aquatic Biodiversity Survey and Baseline Mapping of Freshwater Crayfish and Aquatic Species of the Port Macquarie‐Hastings LGA coastal strip. The final report was issue to Council in January 2014. 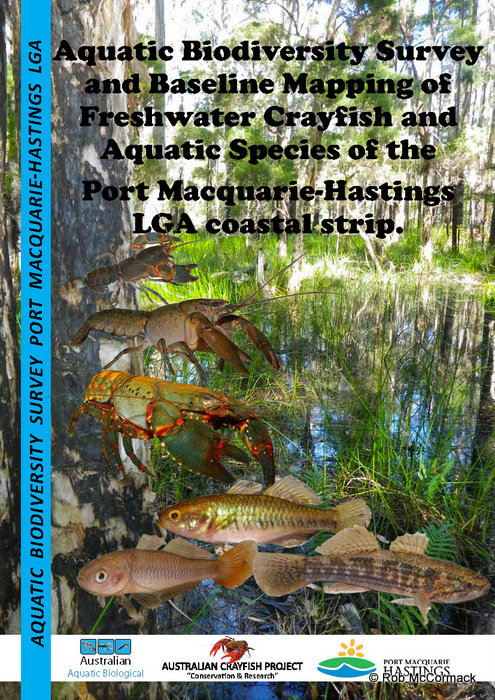 The main aim of this survey was to document the distribution of freshwater crayfish species within the Port Macquarie‐Hastings LGA coastal strip within 20 km of the coastline. 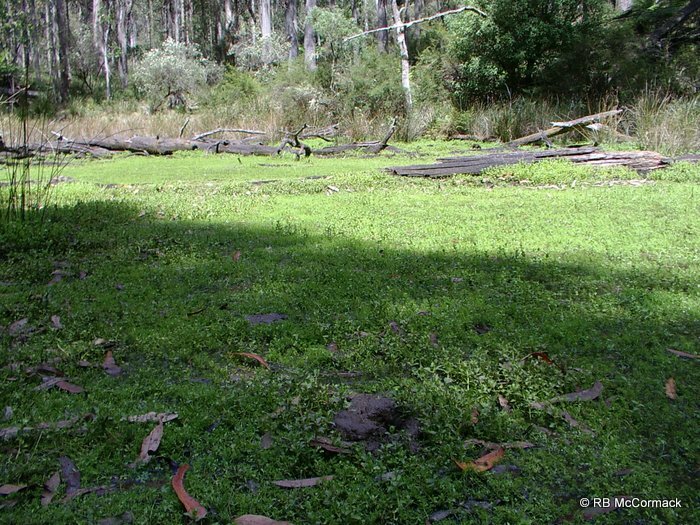 Ephemeral creeks and swamps not normally surveyed were specifically targeted as these areas present suitable habitat for rare and endangered Gramastacus and Tenuibranchiurus crayfish. The survey was conducted between March 2013 and August 2013 representing a time frame including high flow and low flow periods. 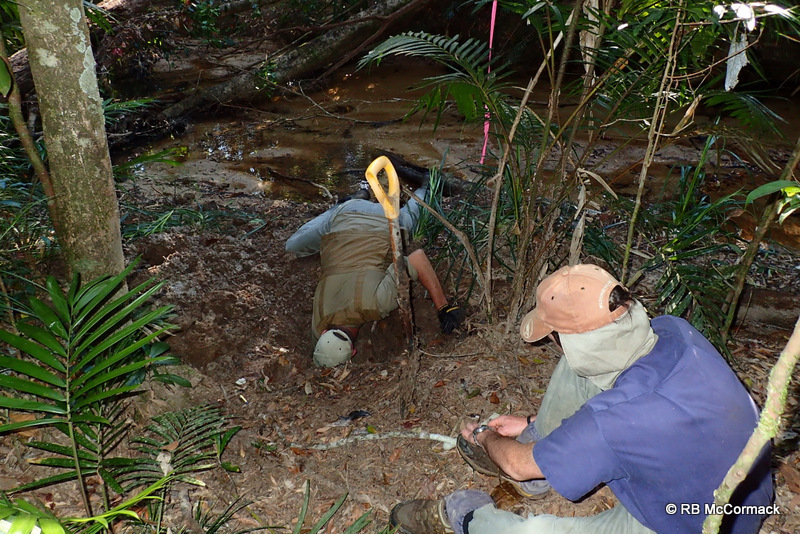 The survey concentrated on smaller creeks and swamps avoiding the larger streams and rivers. 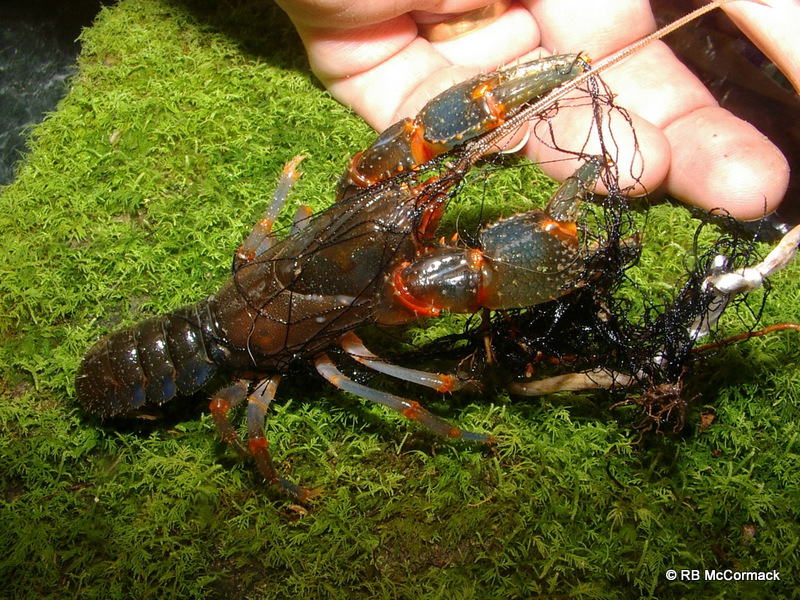 A total of 56 sites were surveyed specifically targeting freshwater crayfish with all other by‐catch species recorded. Of the 56 sites, 48 were ephemeral sites and 8 sites contained permanent water. 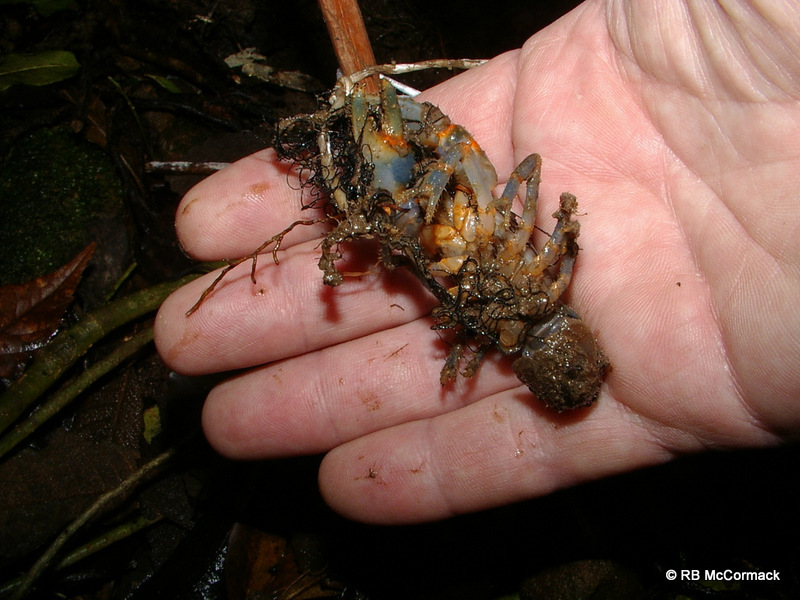 Despite our best efforts we were unable to identify any Gramastacus or Tenuibranchiurus freshwater crayfish in any of the freshwater habits surveyed. 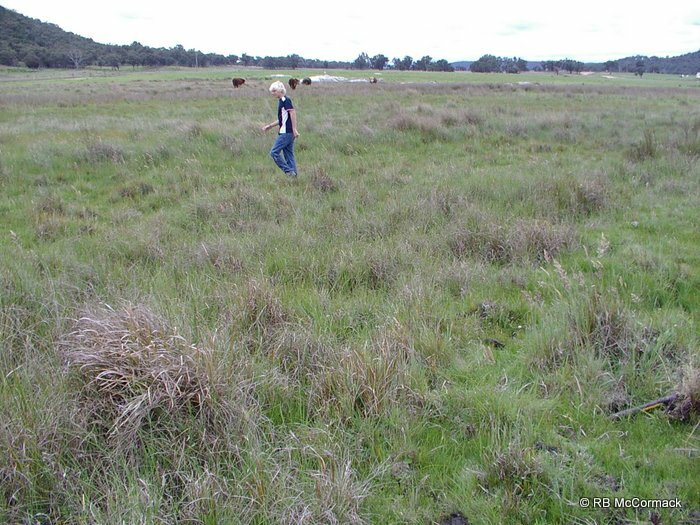 Much of the survey area represents suitable habitat, however we speculate that the Manning River floodplain to the south represents a barrier to dispersal and Gramastacus crayfish which are only found to the south of this significant barrier. 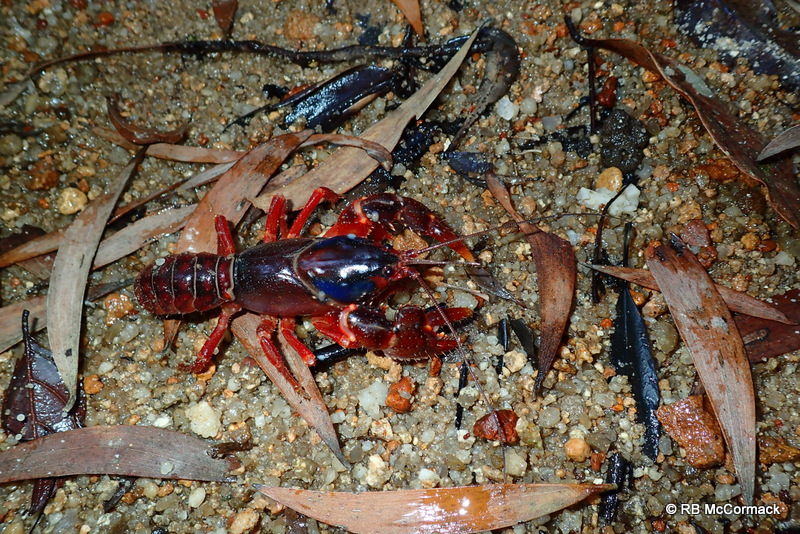 Tenuibrachiurus crayfish were not confirmed from the area and have not been recorded south of Coffs Harbour to date. 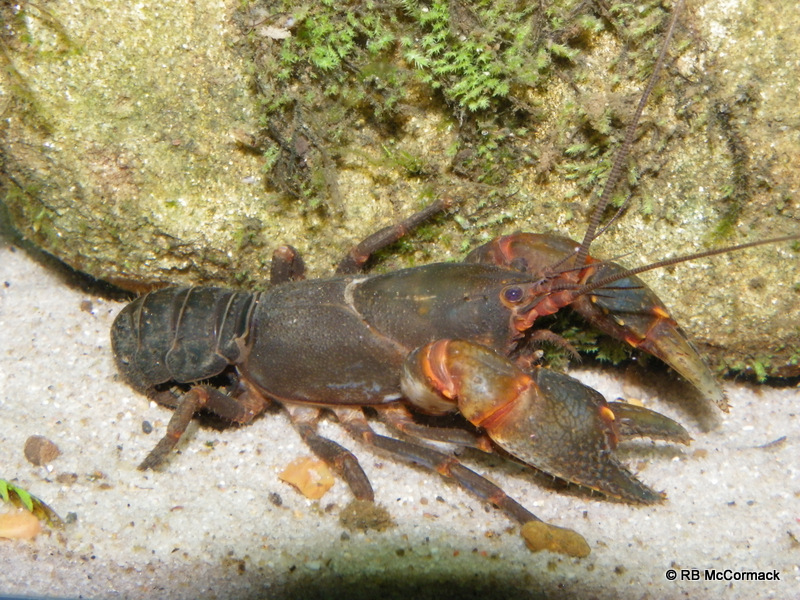 The northern coastal yabby Cherax cuspidatus was found to be widespread and abundant throughout the lower altitude survey area. Currently, the International Union for the Conservation of Nature, Red List infers the species is in decline south of Port Macquarie. Our research indicates the opposite; we found the species to be widespread and abundant south of Port Macquarie. 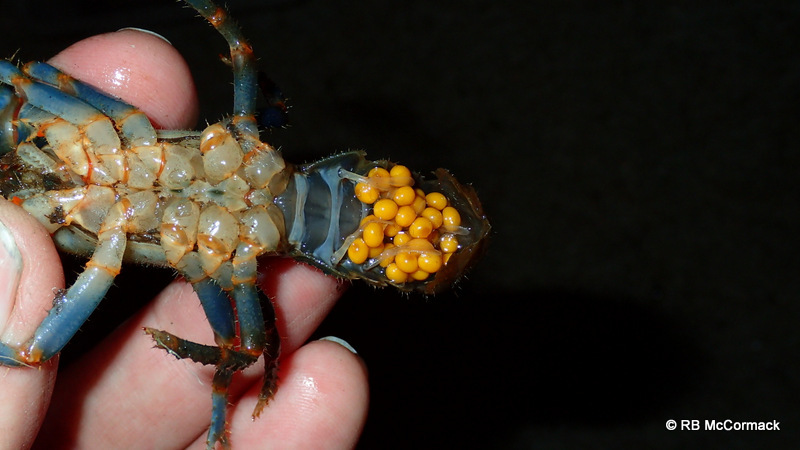 23 Ephemeral sites contained the northern coastal yabby Cherax cuspidatus. 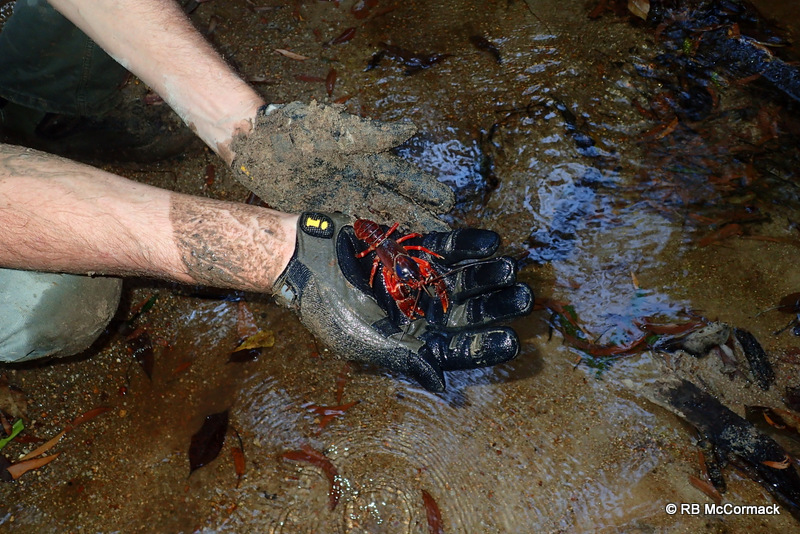 The Hairy Crayfish Euastacus reductus was found to be widespread and abundant throughout the flowing coastal mountain streams within the survey area. 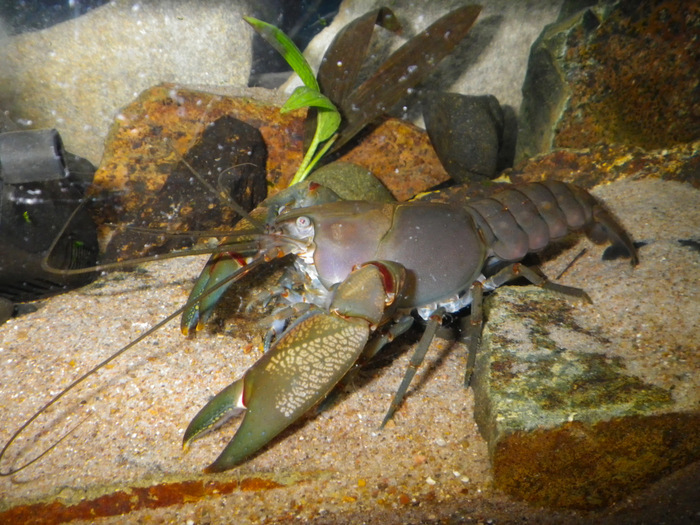 The Giant Spiny Crayfish Euastacus spinifer was found to be present at a number of sites however, extensive suitable habitat was not available along the coastal strip of the survey area and numbers were seemingly low. Additionally, this survey concentrated on ephemeral areas and larger permanent streams were only an additional minimal priority. Broader ACP surveys indicate the species is abundant further inland. 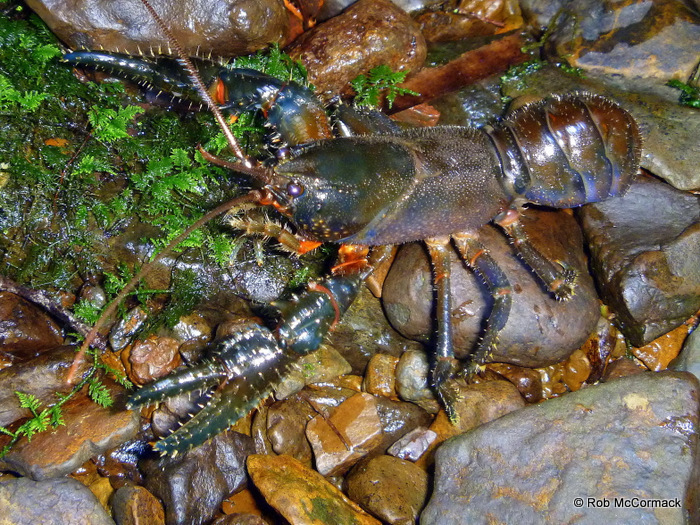 Exceptionally good news was that no invasive freshwater crayfish species were documented with in the survey area. Native gudgeons (firetail gudgeons Hypseleteotris galii, striped gudgeons Gobiomorphus australis and empire gudgeons Hypseleotris compressa) were widespread and abundant at 18 of the sites and exotic Gambusia holbrooki were widespread (12 sites) but at generally low abundance which was encouraging. However, at one site G. holbrooki was at plague proportions which was alarming. The terrestrial weed Lantana (Lantana camara) was common at many coastal sites however it was not rampant. 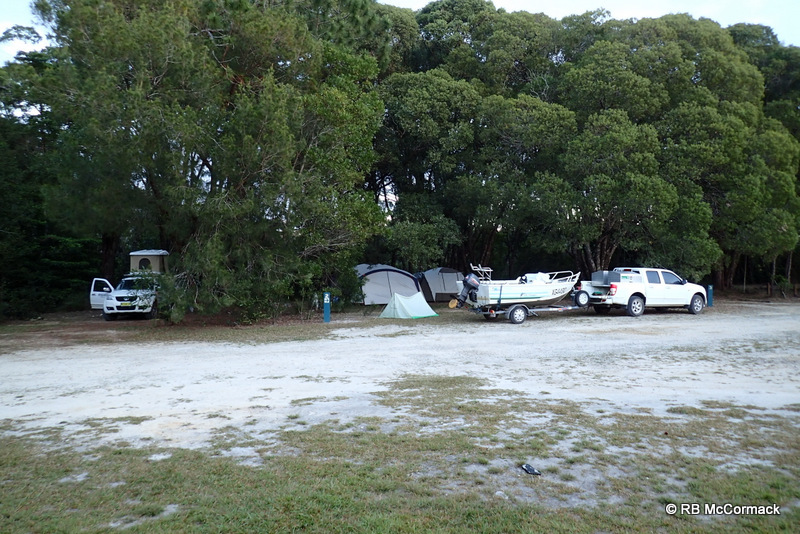 Generally, we found the aquatic health and condition of the creeks, streams and swamps within the survey area to be good. 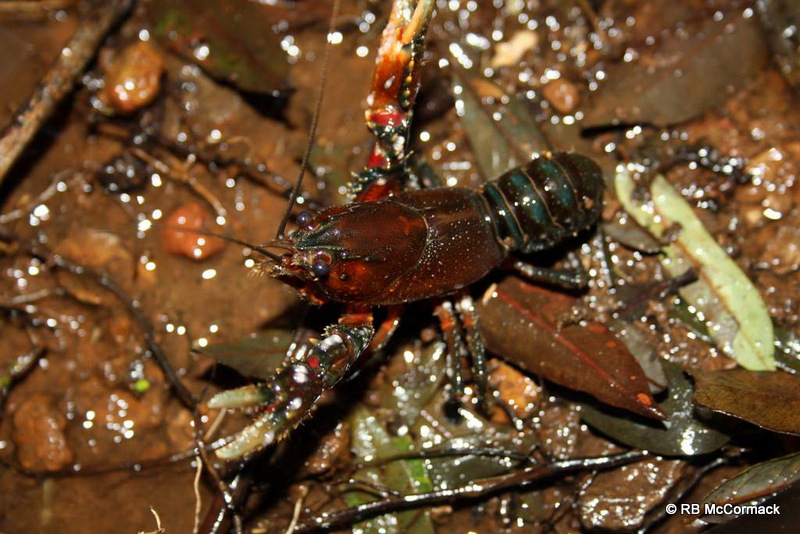 A scientific paper titled; “New records and review of the translocation of the yabby Cherax destructor into eastern drainages of New South Wales, Australia” has been published in the Australian Zoologist. 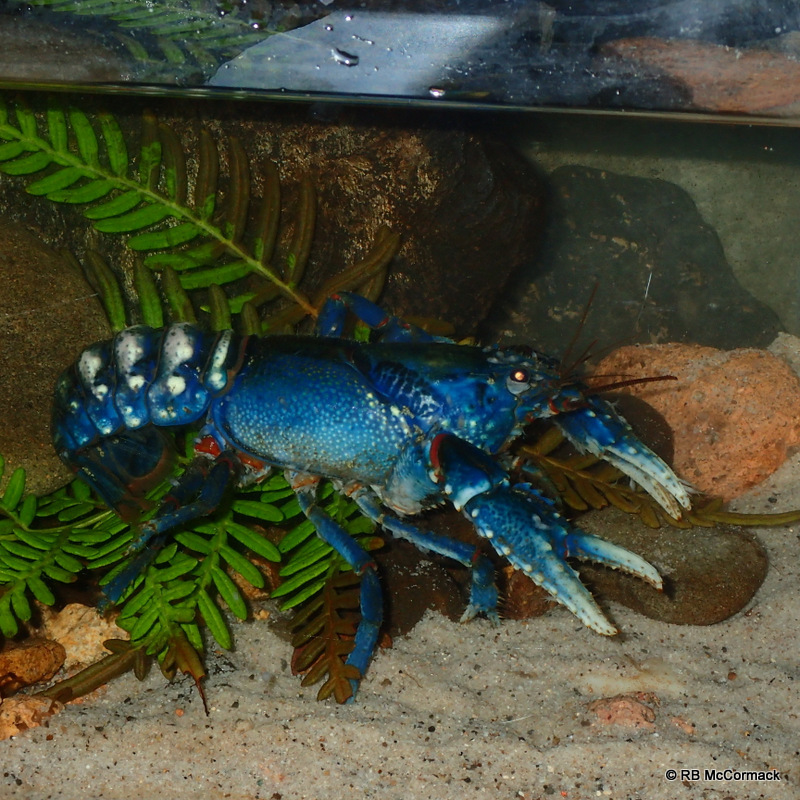 Abstract: The blue claw yabby Cherax destructor is a native of the Murray Darling drainage basin in the interior of south-eastern Australia. In New South Wales (NSW) the species naturally occurs west of the Great Dividing Range but recently, it has become established in eastern parts of NSW, outside of its natural range. 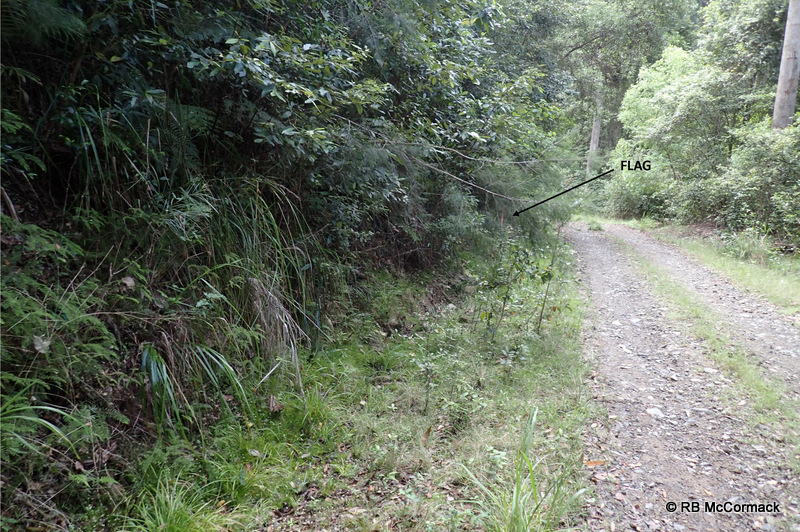 The potential threats and translocation of this species into eastern NSW was first documented at 20 sites by Coughran et al. (2009). This paper builds on their initial work and documents a further 52 translocation sites (Table 1) recorded over the last four years. 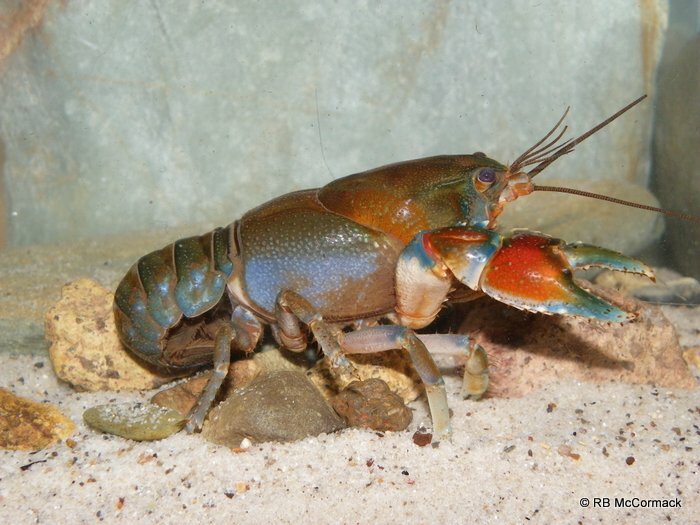 In an effort to further our understanding of the threat, we present information on the dispersal of this species together with observational information on interactions with freshwater crayfish (Parastacidae) species and suggest recommendations to help slow the translocation process. 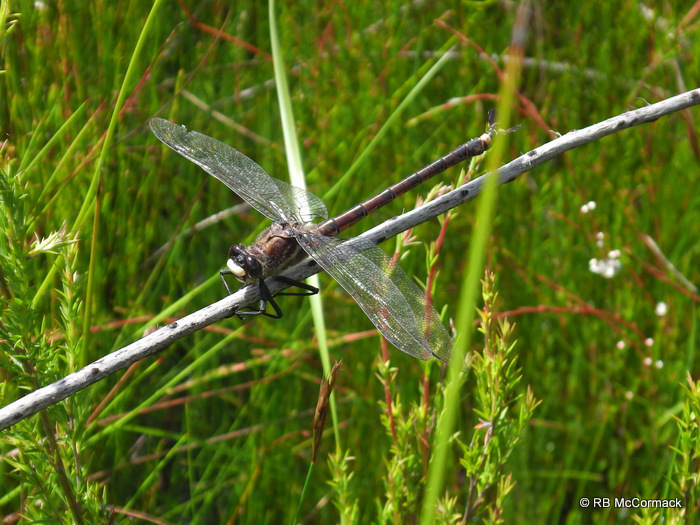 Giant dragonflies (Petalura) have larvae that dig burrows just like crayfish and as part of the ACP we dig them up thinking they are crayfish. 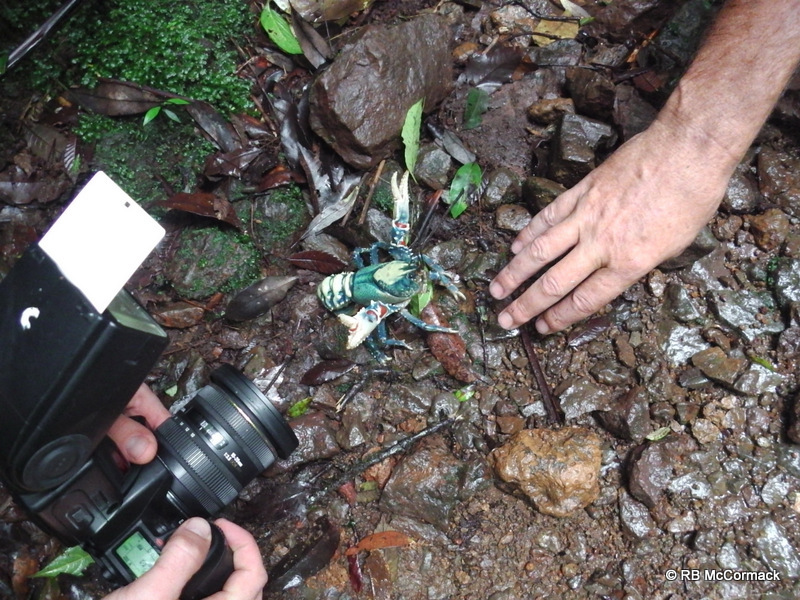 The project takes us to remote or unusual regions and when we come across giant dragon fly larvae it creates interest from Petalura enthusiasts. This has lead to meeting Ian Baird one of the foremost experts on Petalura dragonflys. Our interests coincide and Ian has joined us to research the upper Hastings River and I’ve joined him to check out the highland swamps of the Blue Mountains. Ian is a fountain of information and a bunch of ACP volunteers and myself have learned a wealth of information from him. We will all be looking for giant dragon flies in the future to assist him with his research. 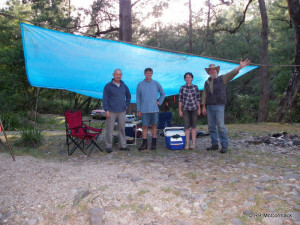 For some years now Hugh Jones has joined us for expeditions along the Clyde and Shoalhaven rivers. Hugh’s forte is freshwater mussels and we are all learning heaps from Hugh. 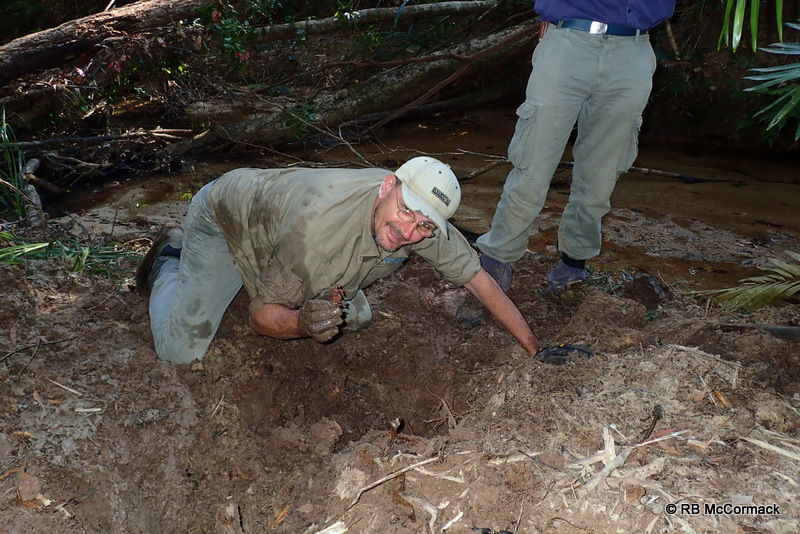 As a result of Hugh’s education all ACP volunteers are seeking mussels as well as crayfish when we are in the field. Hugh and I manned a stand at the Gloucester Platypus festival together for the second year in a row. 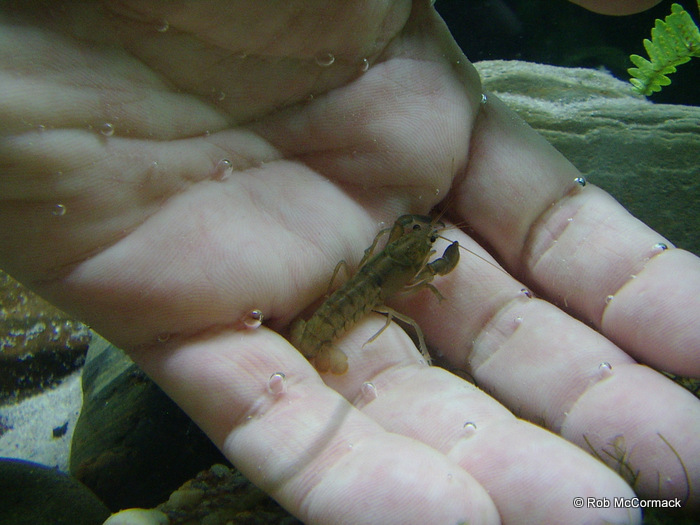 Hugh touts the benefits of freshwater mussels to the ecosystem and I tout the benefits of freshwater crayfish. 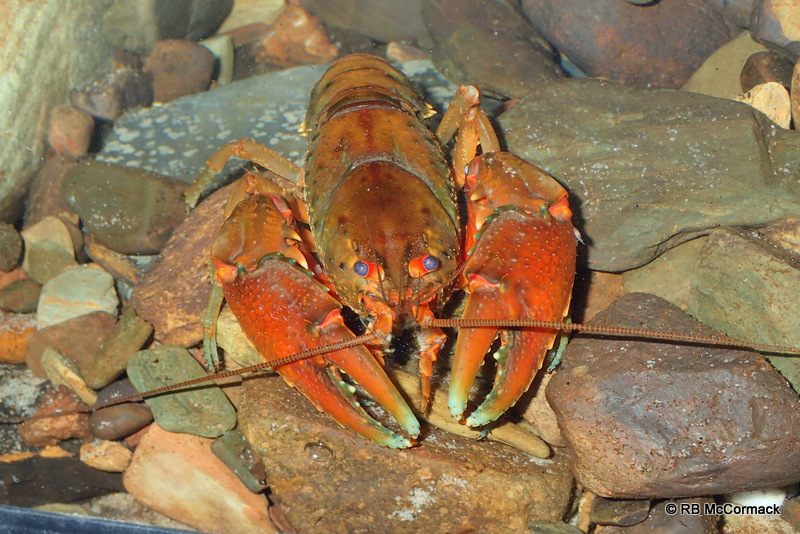 New records and review of the distribution and ecology of freshwater crayfish (Crustacea, Decapoda, Parastacidae) of the southern catchment of the Clyde River, New South Wales, Australia. Our paper is completed and final corrections are being done prior to submission. 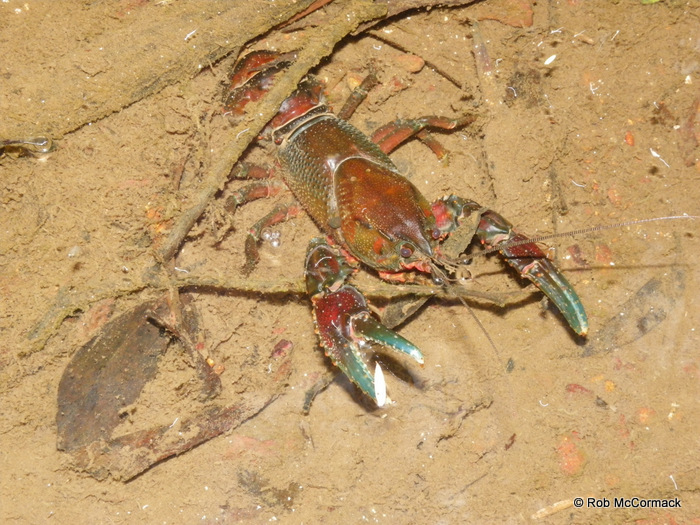 Aquatic biological surveys for freshwater crayfish were undertaken in the southern catchment of the Clyde River, New South Wales. 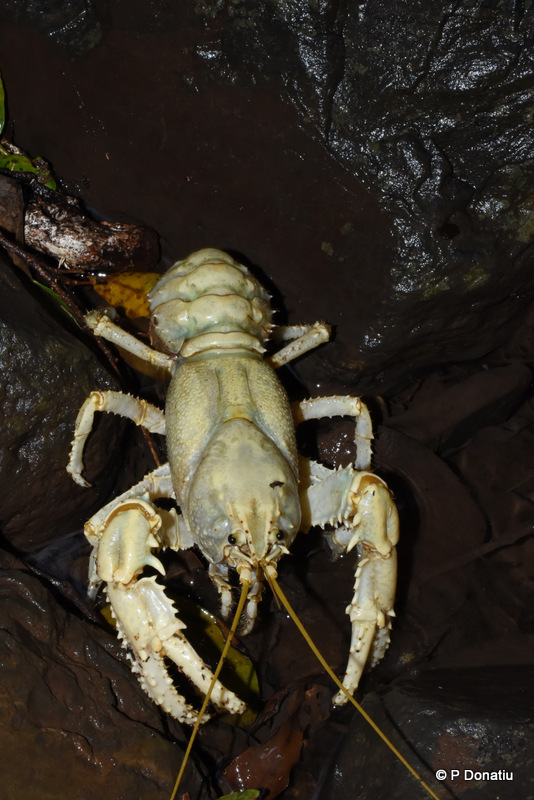 57 sites were surveyed, from 43 sites 192 crayfish were captured and examined with individual size, weight, sexual maturity, fecundity and physical condition recorded. The distributions of native Euastacus spinifer and Euastacus yanga are documented, together with biological and ecological information on species interactions and habitat partitioning. Currently this paper is on hold awaiting genetic analysis as we found some interesting morphological variation between upper catchment and lower catchment species. 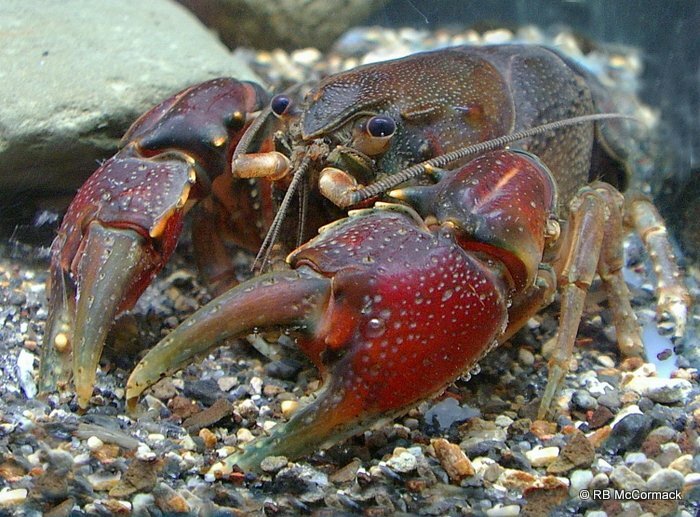 The Terrestrial Crayfish Euastacus maccai (McCormack & Coughran 2008) is an intermediate group crayfish (McCormack 2012) from northern New South Wales that prefers terrestrial habitats with subsurface water. 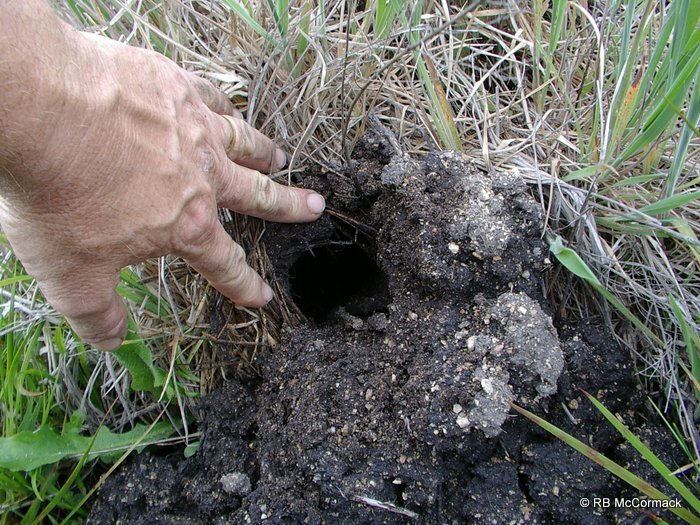 They burrows in ephemeral habitats with green terrestrial vegetation growing on the grounds surface above and around the burrows. This is a high altitude species, preferring over 1000 m on the tops and sides of the mountain peaks in wet depressions, soaks and springs towards the top of the catchment. A nocturnal species that rarely leaves the burrow system, then only occasionally at night and only during wet conditions. This species is unusual to all other NSW Euastacus species in that it prefers terrestrial environments just like an Engaeus species. I expect it uses creek systems in flood conditions to migrate and travel but to date we have never captured one from a flowing creek system despite them being close by. 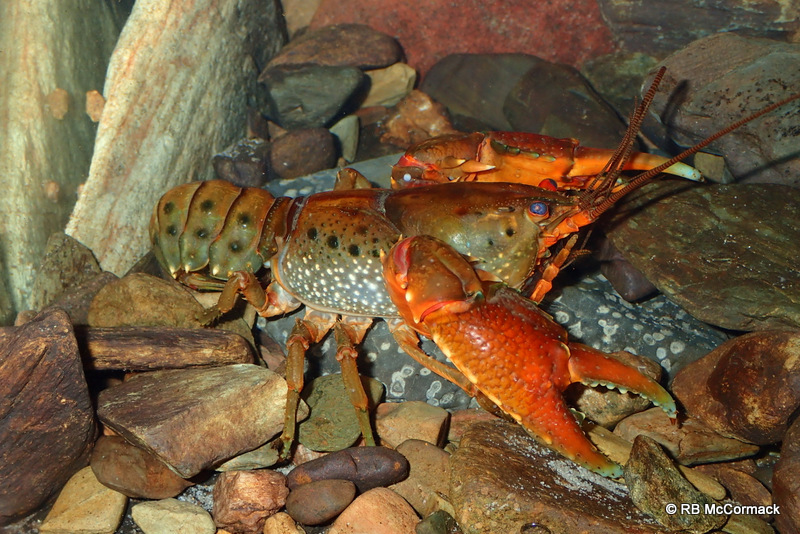 Horwitz and Richardson (1986) classified Australian crayfish burrows based on their relationship to the water-table, into three categories (Type 1-3). Euastacus maccai is generally found away from main flowing water bodies in type 2 burrows that are connected to the water table but not the creek system. 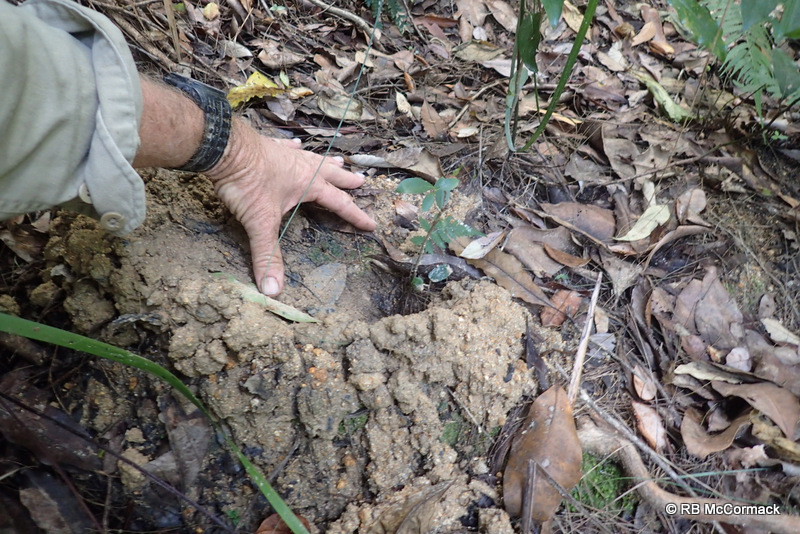 Burrows are intricate and extensive, starting under vegetation or structures without any connecting to any nearby water body. All burrows are constructed in wet areas that may have occasional surface water but always subsurface water, with the major part of the burrow system well above the water table and much of the burrow system never contains water. 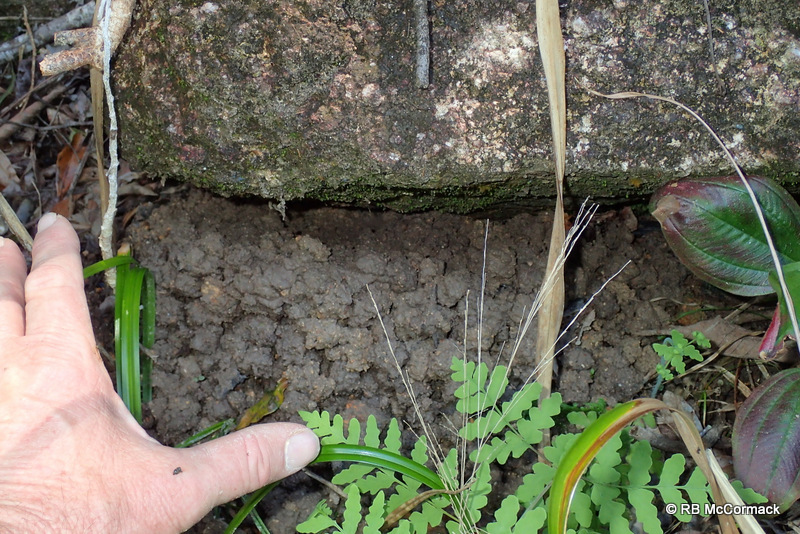 The grounds surface above the burrow system is characterised by green grasses and or terrestrial plants. 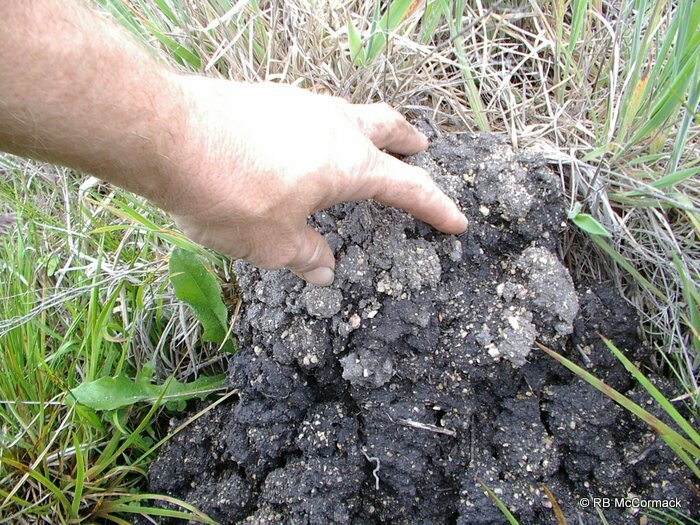 Large funnel mounds or soil piles in the grass indicate the crayfish burrows presence. 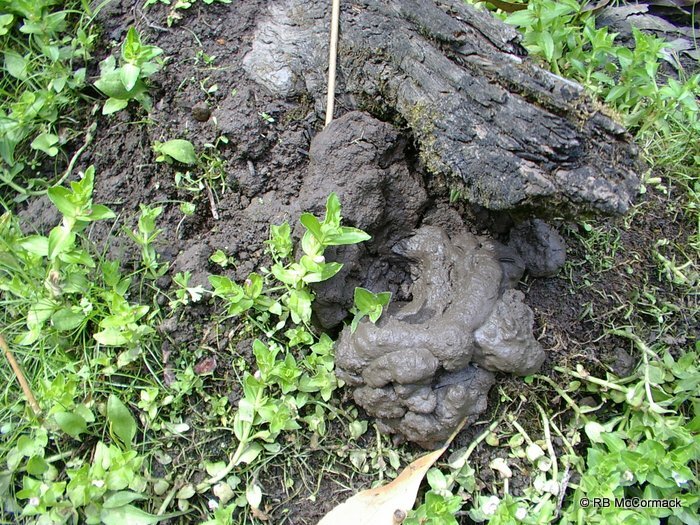 Generally found in ephemeral soaks, cattle paddocks, flood plains and spring-fed swampy areas. Many of the ephemerally wet areas that support large populations of E. maccai remain dry for 12-24 months yet surprisingly the species still thrives in these areas. The species seems very adaptable with many of the new colonies of the species are in man made drains and quarries, etc. 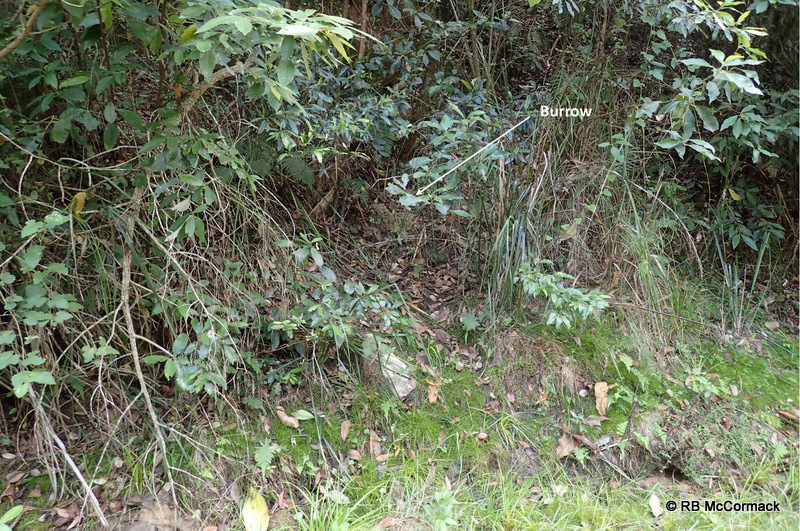 This is the sketch of the burrow from an E. maccai captured in Nowendoc State Forest. The critter was captured under the log! However, I continued to systematically excavate the burrow taking notes to see if more than one critter inhabits a burrow. To date only 1 per burrow but I’ve never made it to the bottom so who knows. Generally two to three short gently sloping surface entrances lead to a central burrow that generally runs parallel to the surface. 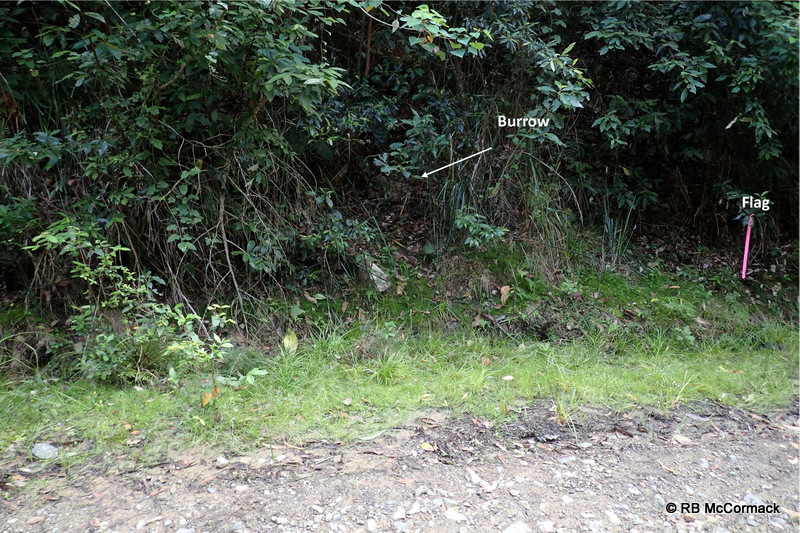 Burrows and blind chambers branch off this central burrow where the crayfish spends most of its time. Off this burrow will be a deep water-filled burrow that continues down over 1.5 m and possibly over 3 m. Crayfish use the water to keep moist, but spend most of their time in the dry burrows. 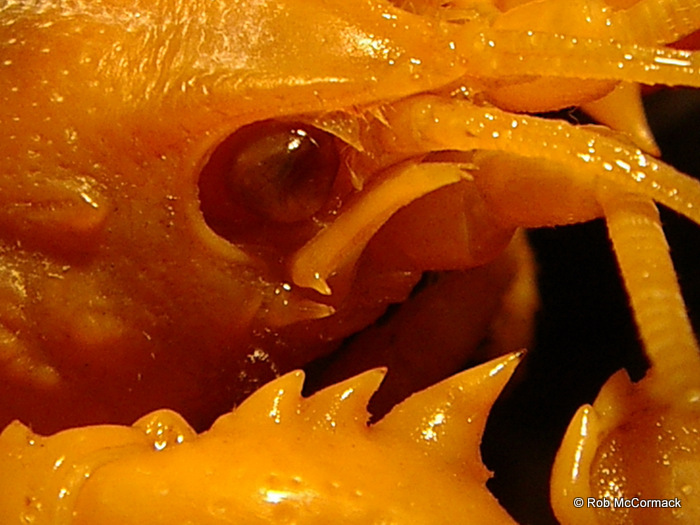 Euastacus maccai is a high altitude (800–1400 m) species found along both sides of the Great Divide. Distribution starts in the upper catchments of the Peel, Macdonald, Cobrabald, Apsley, Tia, Yarrowitch, Mummel, Walcrow, Cooplacurripa, Nowendoc, Barnard, Hastings and Forbes rivers. Most populations are isolated and spread over a wide area. 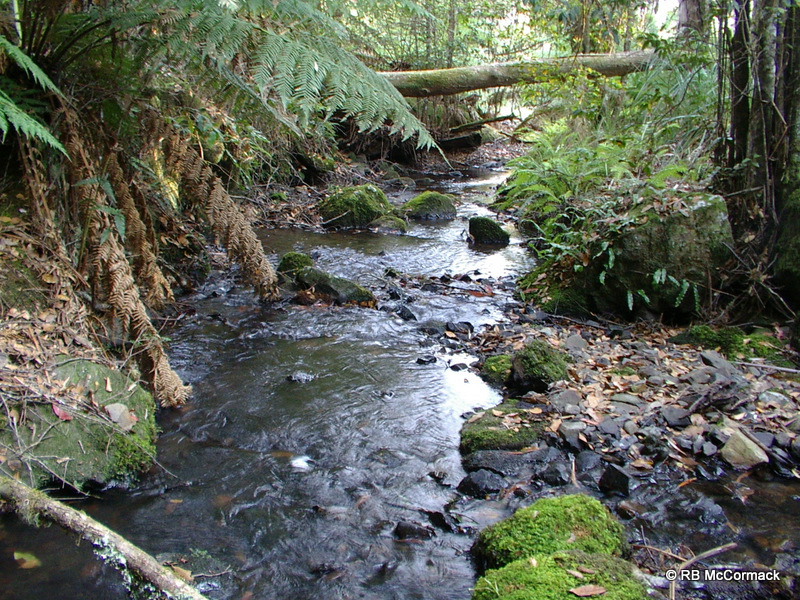 The species has only recently been discovered in the upper Hastings and Forbes rivers within the distribution areas of Euastacus spinichelatus and Euastacus clarkae (McCormack in prep). 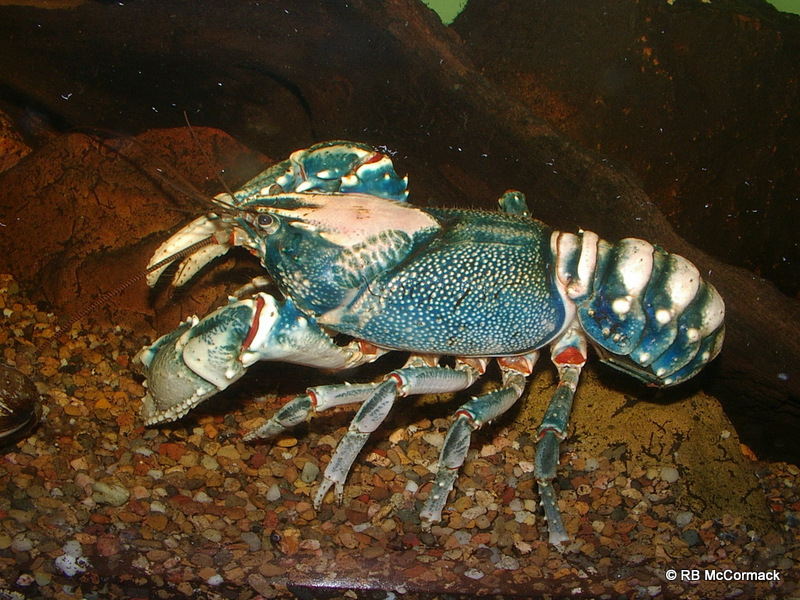 Also known to occur near Euastacus gamilaroi and Cherax destructor. Horwitz, P.H., and A.M.M. Richardson. 1986. 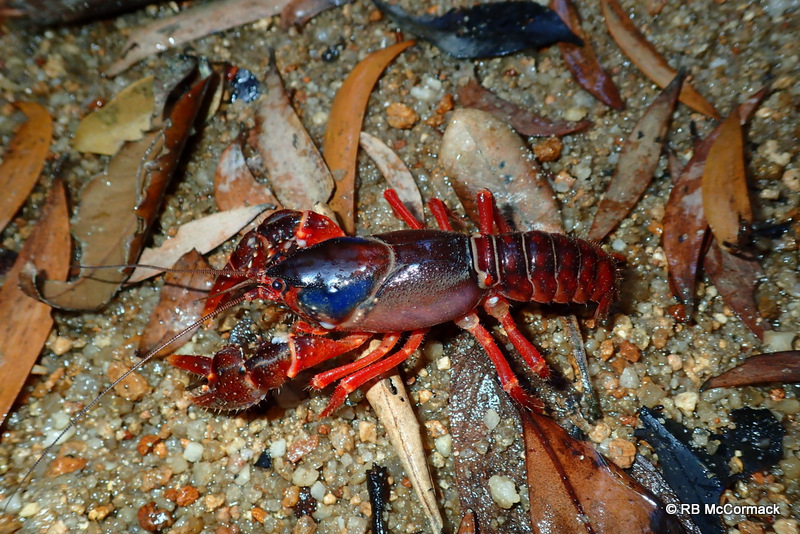 An ecological classification of the burrows of Australian freshwater crayfish. Australian Journal of Marine and Freshwater Research 37: 237-242. McCormack, R.B., and J. Coughran. 2008. 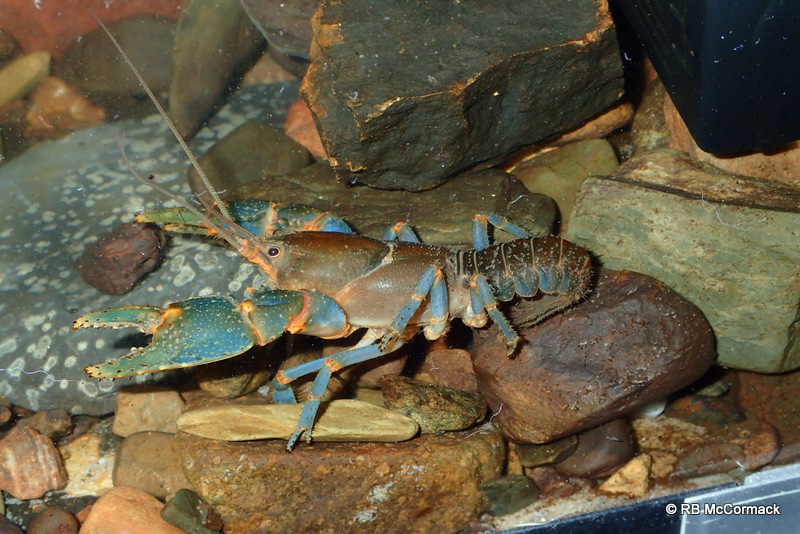 Euastacus maccai, a new freshwater crayfish from the Great Dividing Range, New South Wales. Fishes of Sahul, Vol 22, (4). McCormack, R.B. (in prep). 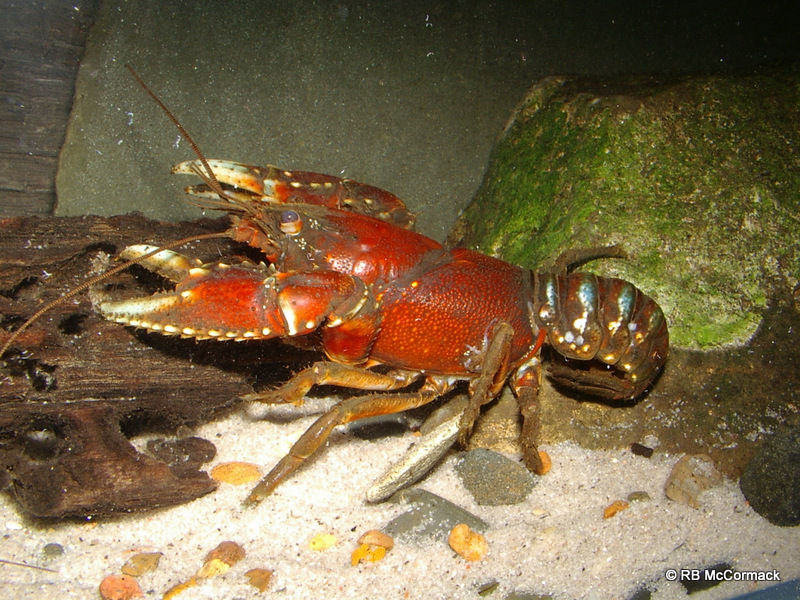 Distribution of freshwater crayfish (Decapoda: Astacidea: Parastacidae), within the Hastings River catchment, New South Wales, Australia.